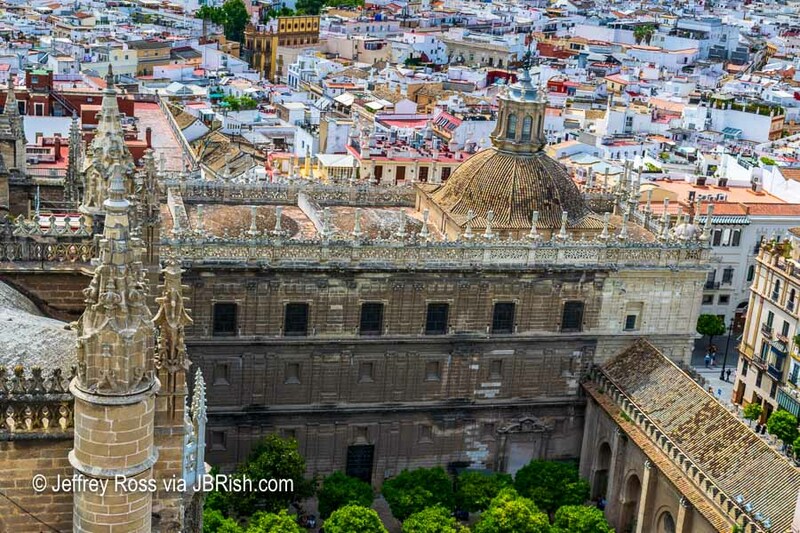 Perhaps the premier tourist destination in Seville is The Cathedral of Saint Mary of the See (Seville Cathedral). 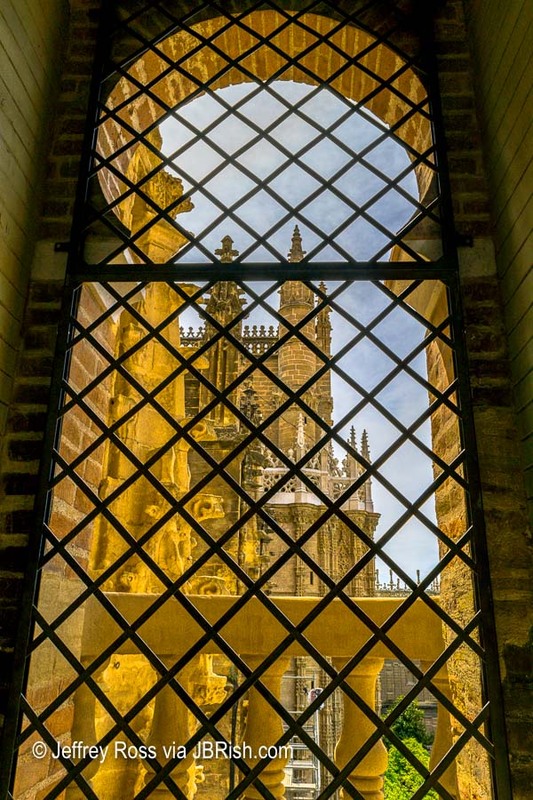 The construction of this edifice lasted more than a hundred years with the intention of creating a cathedral that was magnificent beyond the imagination of the day and in that they succeeded. 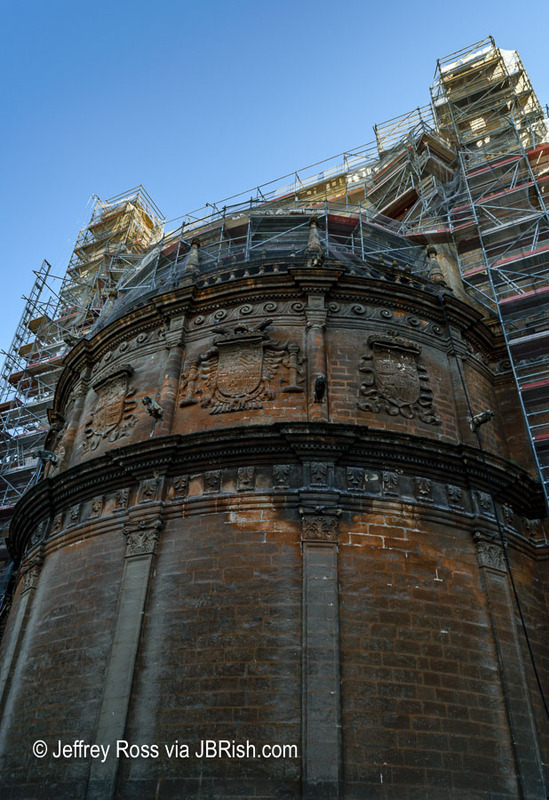 Like most old landmarks, there is usually some construction or renovation being conducted at any given time. We can only be hopeful that it is nothing major when we arrive. 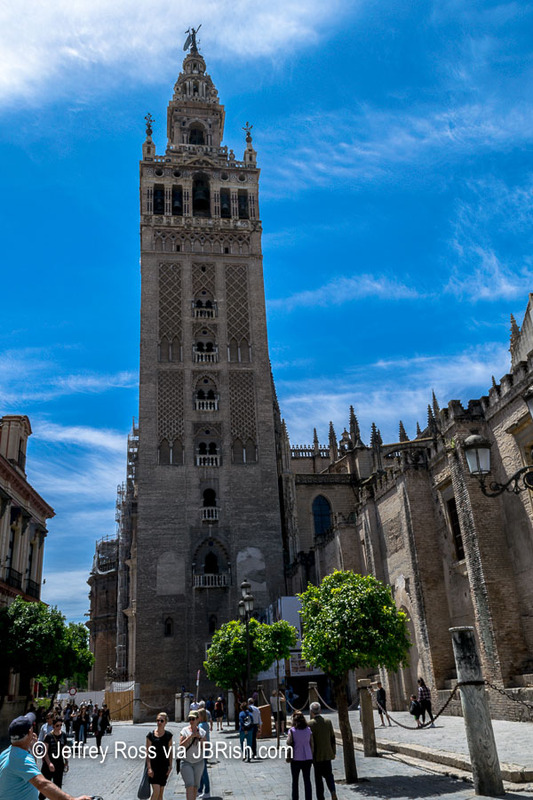 The Cathedral with its famed bell tower (The Giralda – pictured below) can be seen from many viewpoints near the central area of the city. There are a number of entrances to the Cathedral. 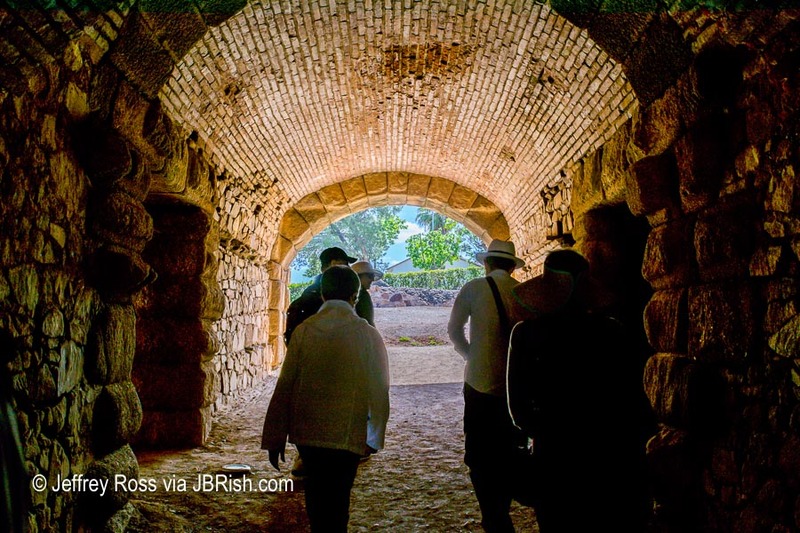 We accessed the edifice through a side entrance referred to as the Door of Forgiveness. 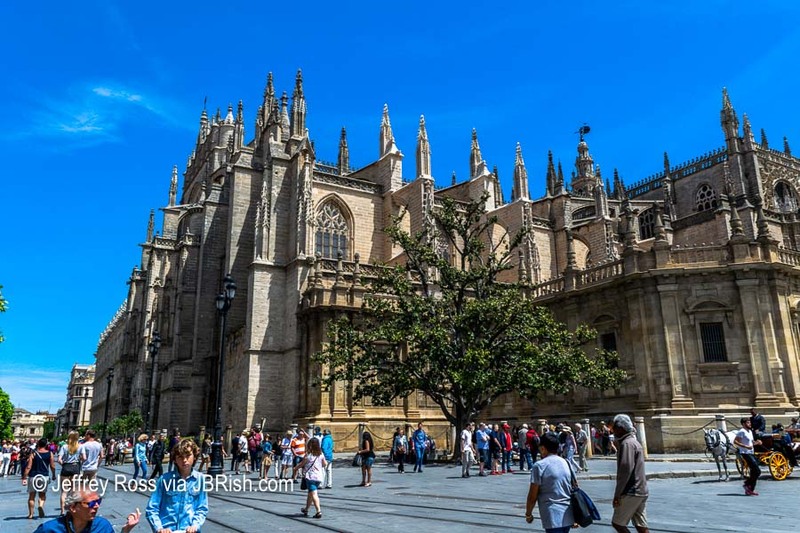 This basilica is the largest Gothic cathedral in the world and the third largest church overall. 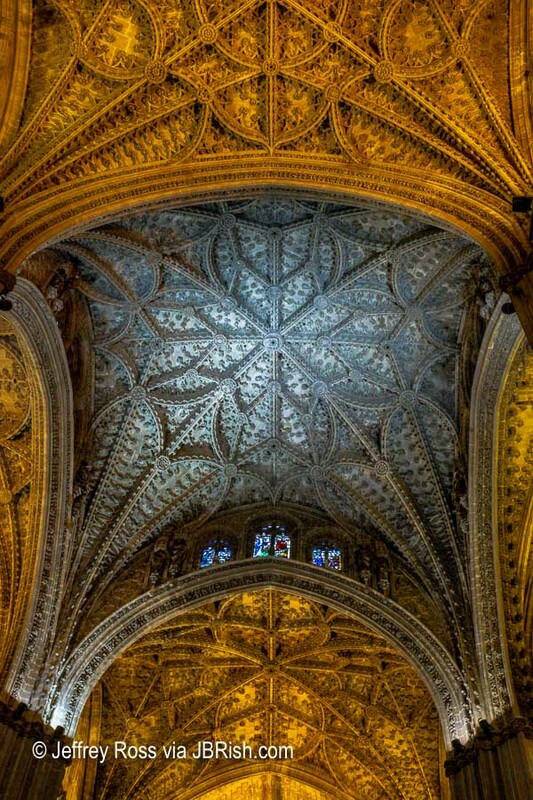 The ceilings were beautiful works of art and vaulted to more than 130 feet. Standing there looking upward, one can only wonder how they managed to create the detail and elegance on display. Visitors will almost assuredly feel overwhelmed by the size of this structure. The picture below is of one of the side hallways and juxtaposes the very old holy building with the contemporary well-lit signs pointing visitors to some of the highlights. I think it would be difficult to observe and appreciate everything there is to see in one visit. There were many people milling around and it is difficult to take photographs without the heads of the visitors seeming to adorn the bottom of the frame. We decided to focus on the highlights. 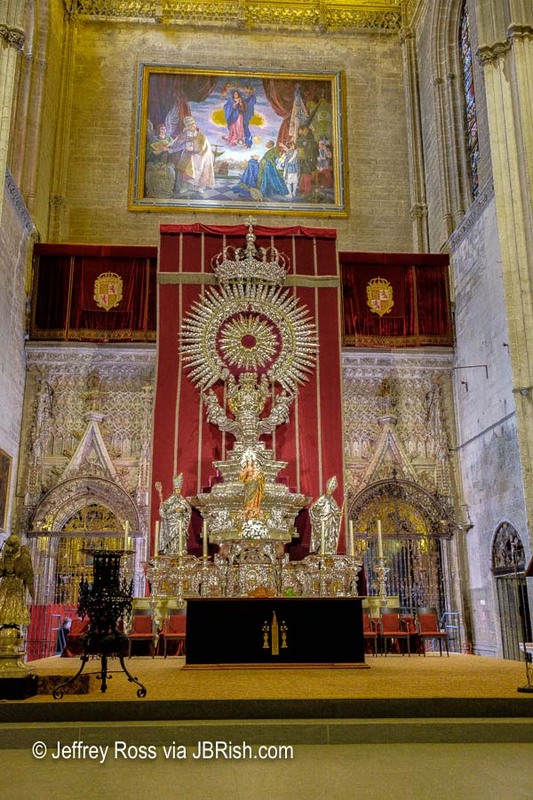 One of the beautiful altars in the Cathedral is the Altare dell’Argento or Silver Altar (of the Virgin Mary). 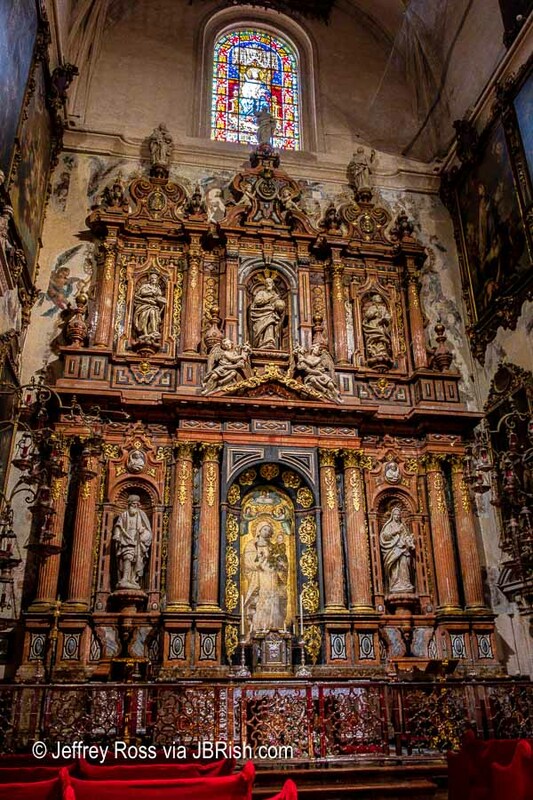 Another altar that was magnificent because of the ornate wood carvings, statue-filled niches and gilding was the The chapel of the Virgin of Antigua. 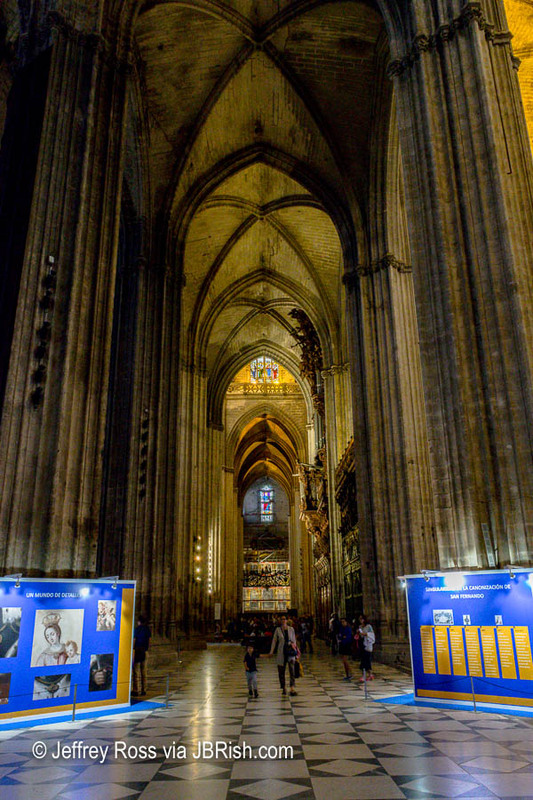 During the period that the Cathedral was being constructed, architects tried to fill every space possible and the “fear of the void” is well demonstrated here. The massive mahogany organ is another feature that is breathtaking in both size and exquisite detail. 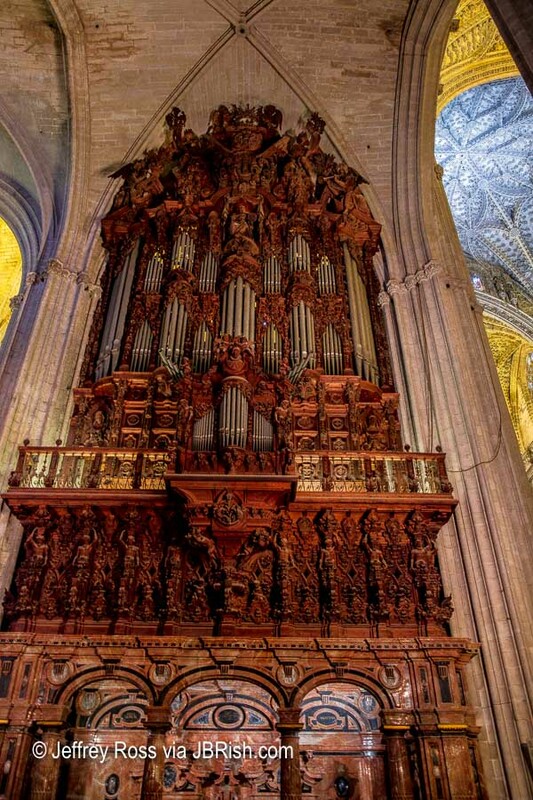 It would stand singularly as a work of art had it not contained the musical pipes and workings of the organ. The original organs were lost during the 1888 earthquake and subsequently replaced in 1901-03 which, in turn, have also been subsequently updated. 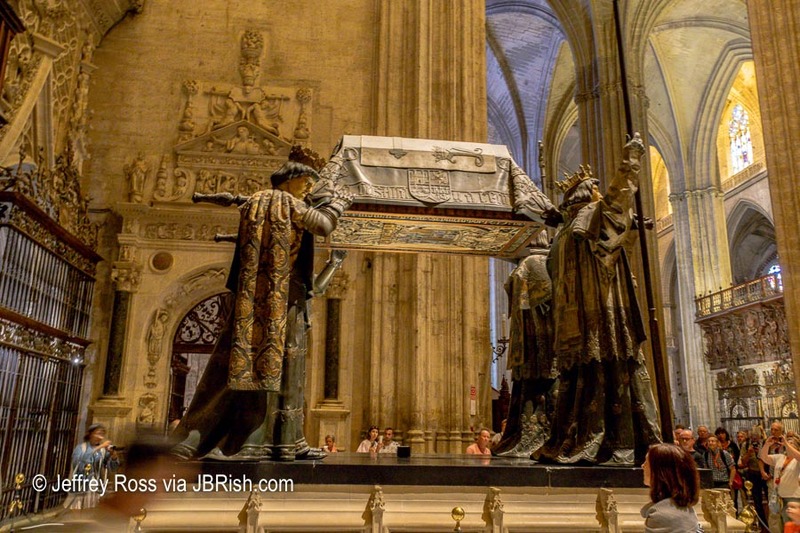 Perhaps one of the most visited and coveted sights in the Cathedral is the Tomb of Christopher Columbus installed in 1899. 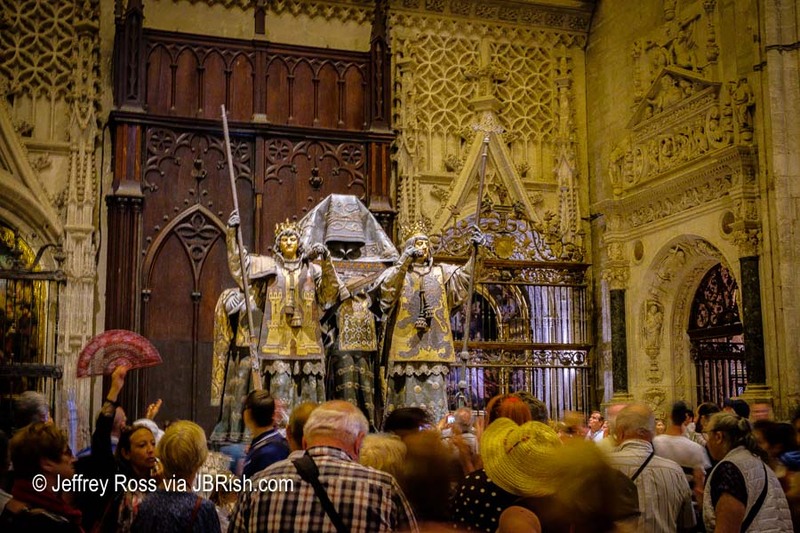 The body of this noble explorer has taken several trips across the seas being held in Santo Domingo (now the Dominican Republic) and Cuba before being brought to Seville. 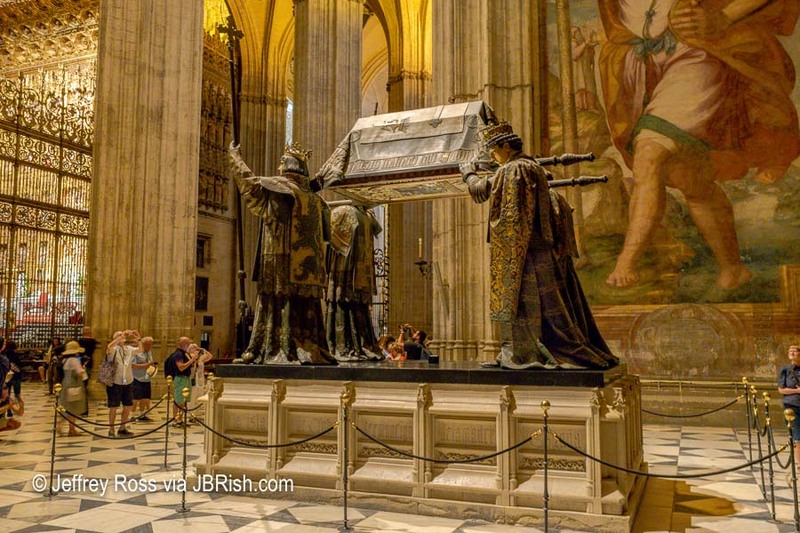 The tomb is a work of art with statues of four kings, each representing the kingdoms of Spain during the time Columbus was alive, hoisting high his bodily remains. 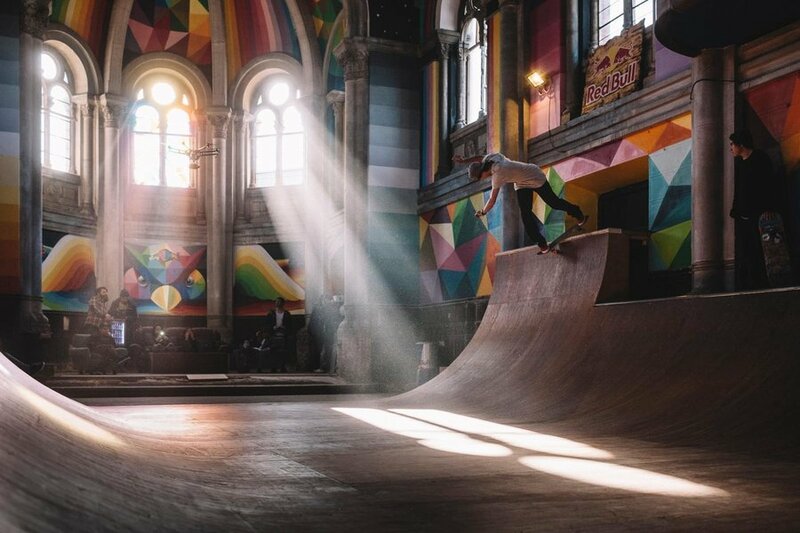 As you can see this is one of the more popular attractions within the Cathedral. 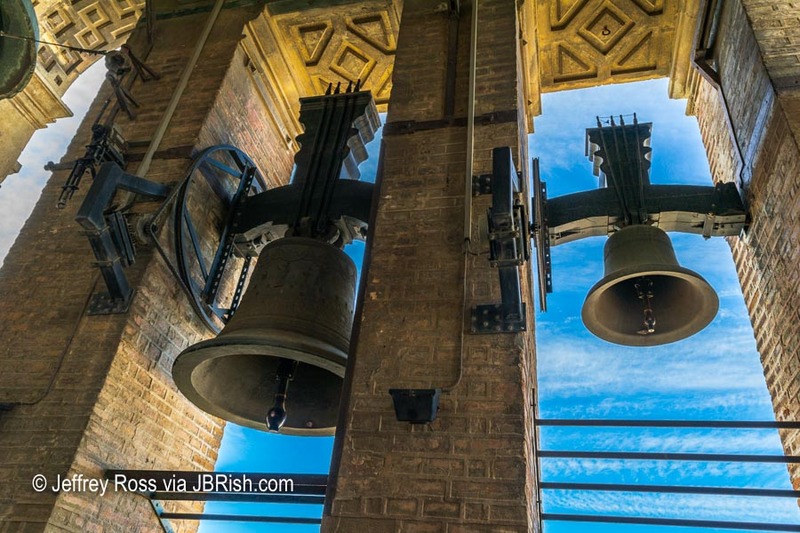 Before leaving the Cathedral, a climb to the top of the Bell Tower, accessed via a series of ramps, was warranted. Traffic can be heavy going up and down. Adventurers will be rewarded with some excellent views of the city despite the heavily fortified vantage points. The crowds can be somewhat daunting and pushy as eager tourists jockey for the best views. Do stop along the way to look out of the various windows and viewing nooks. 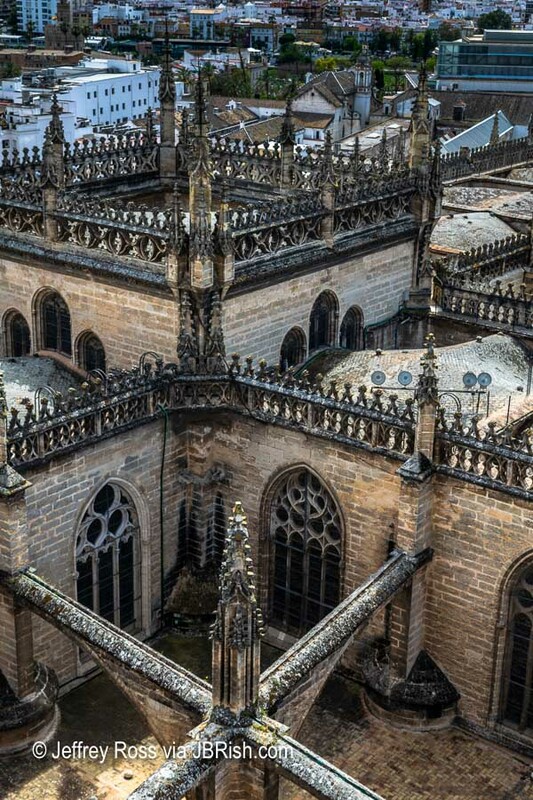 Glimpses of the architecture and Cathedral structure are captivating. 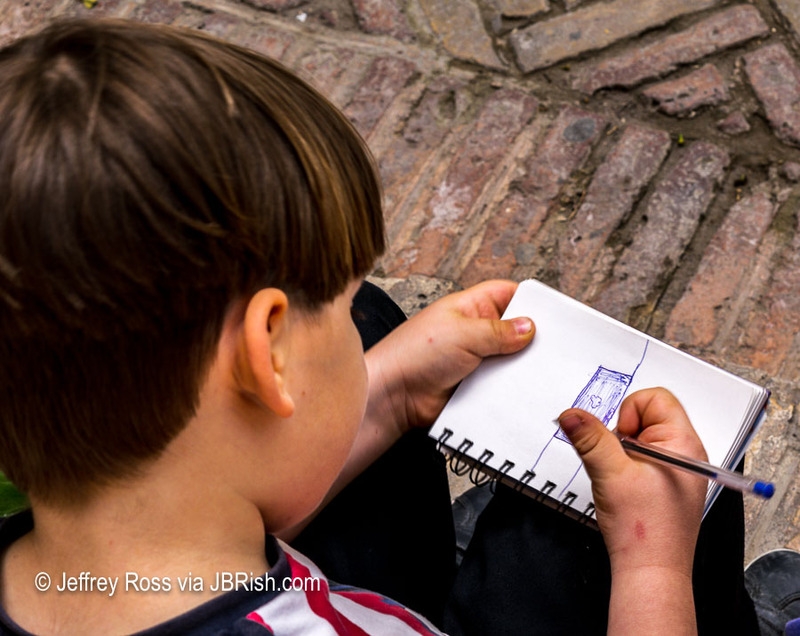 Before we left the premises, we strolled through the courtyard where some children were enjoying the atmosphere as they sketched the scene before them. 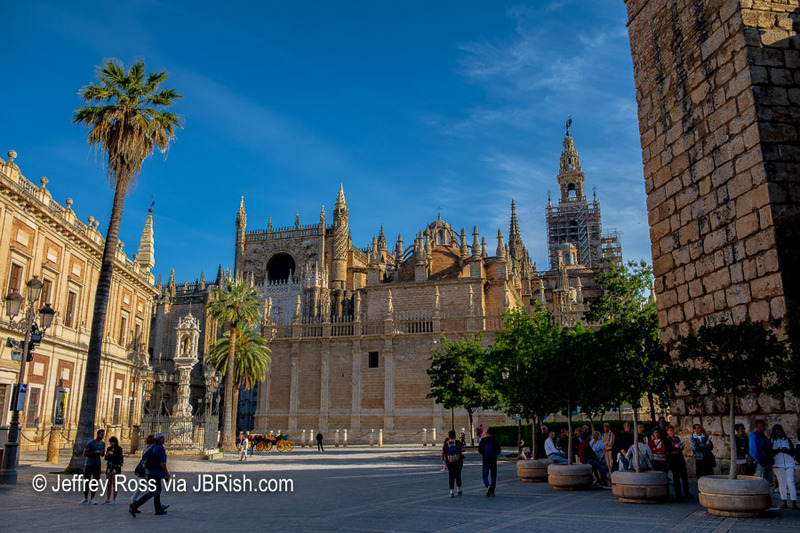 Here is one more look at the exterior of the Cathedral of Seville. On our way back to the hotel, we enjoyed this beautiful circular garden which had street performers entertaining onlookers nearby. 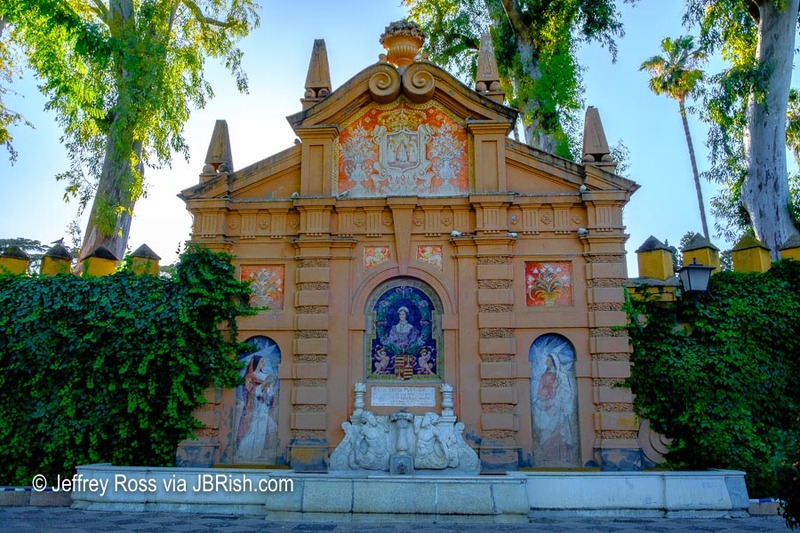 Next, we will say farewell to Seville with one last look around town. 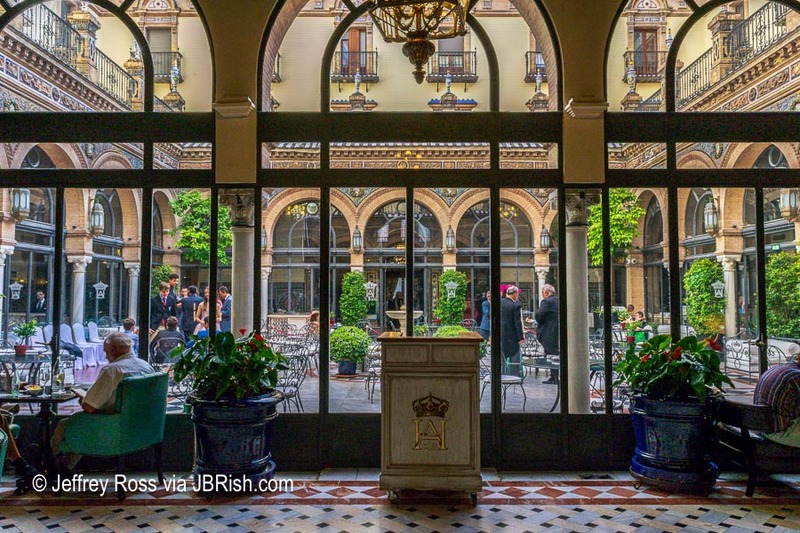 In Seville, the Alfonso XIII hotel would be our home for the next several days. 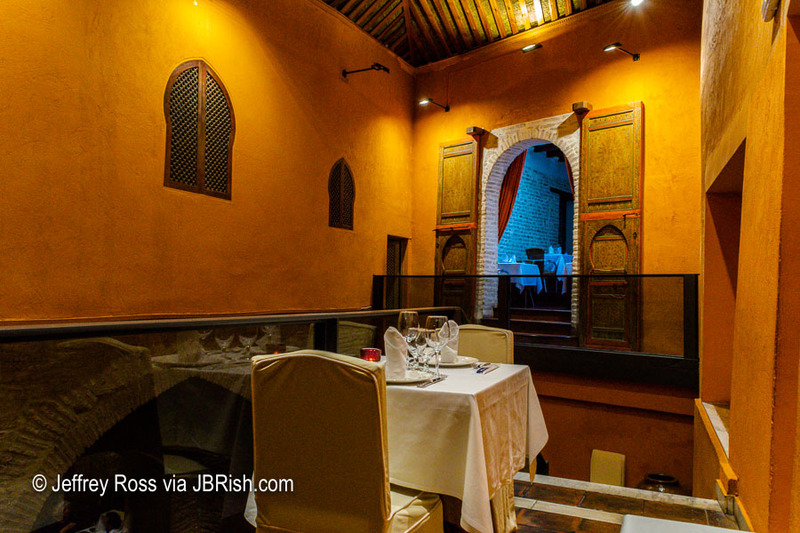 This historic and handsome building was refurbished in 2012 in the Andalusian style. It is stately and beautiful. This photo shows a portion of the gallery which frames the courtyard square. One of the first things we like to do whenever we arrive in a new city is to “drop our bags” and take a walk around the town. This gives us a lay of the land, so to speak, and an idea of what we might like to investigate during our visit. 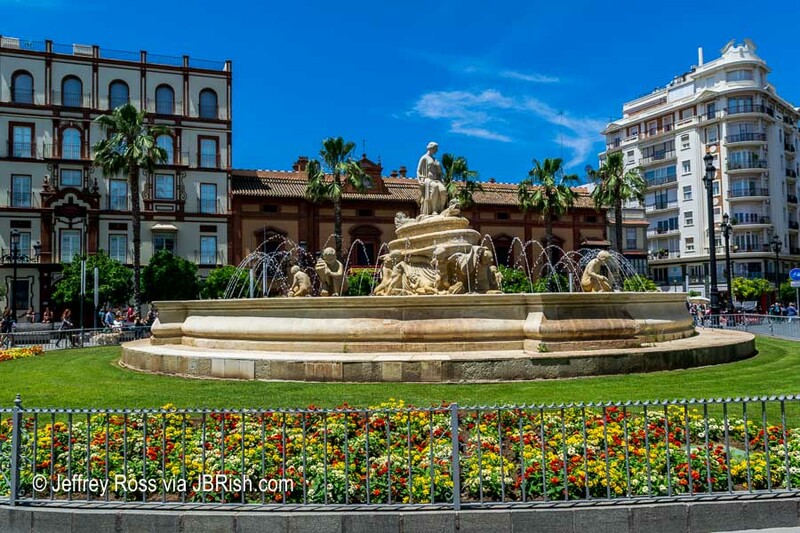 As we walked in and around the area near the hotel, we came across architectural accents and gardens that drew our attention. 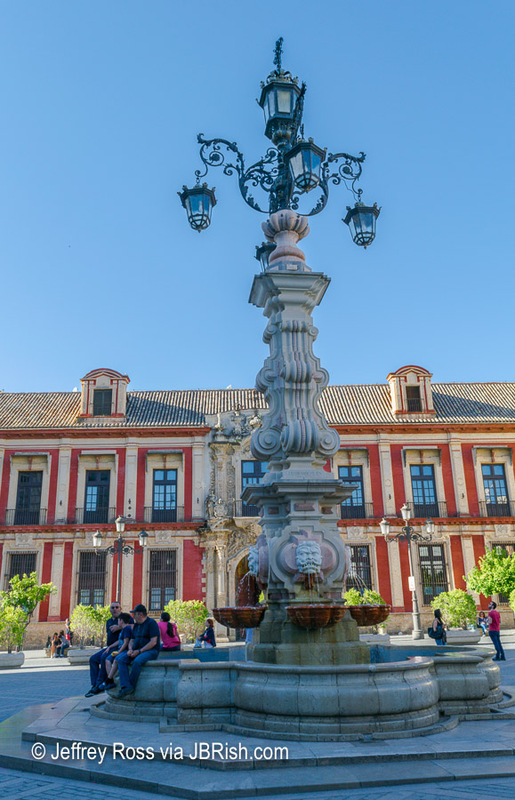 This fountain and street lamp combination at the Square of the Virgin of the Kings (Plaza Virgen de los Reyes) seemed to be a popular resting or meetup place and hub for points of interest. 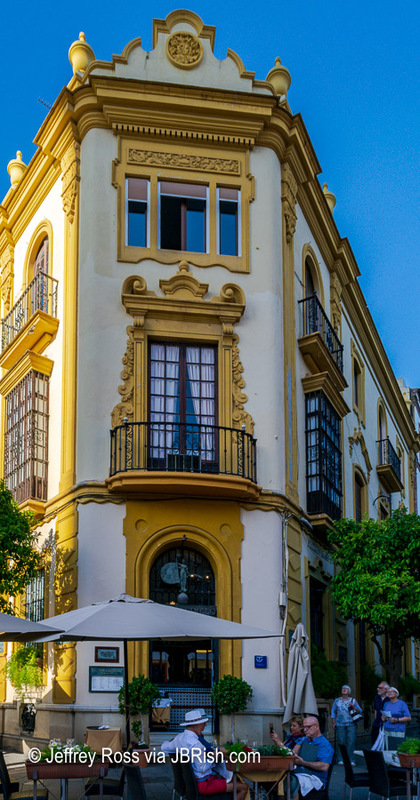 There were so many fascinating buildings in the central area of Seville, that it was hard to capture all of them. 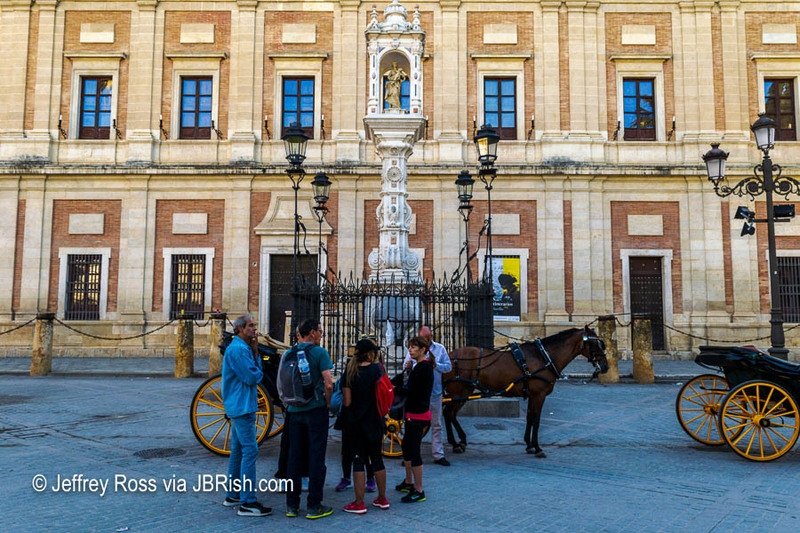 Horse drawn carriage rides are available at the square outside the archdiocese seen here in front of a statue of the Madonna and child. 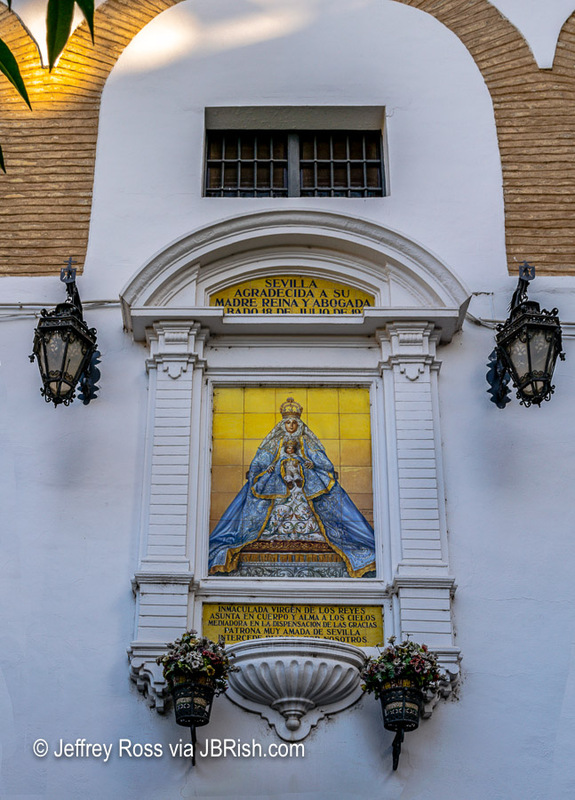 Although the sun was lending only a bit of light and shade covered most of the wall, the facade of the Convent of the Encarnación with a ceramic depiction of the Virgin Mary against gold tones was impressive. 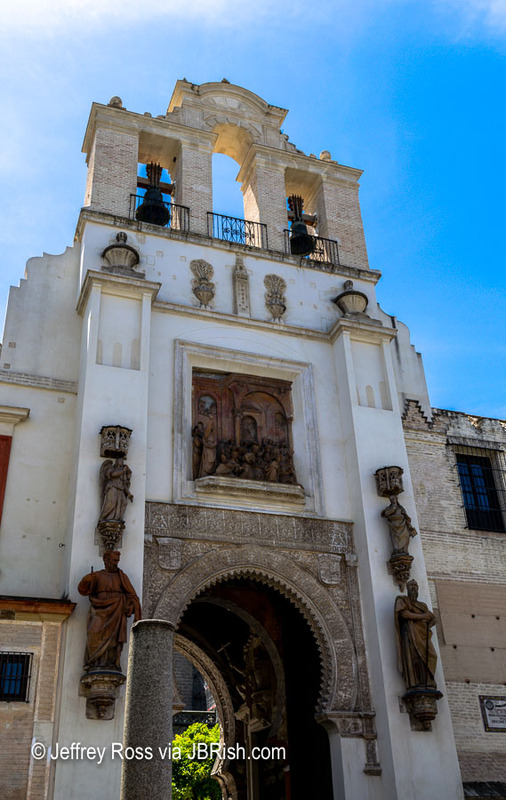 It is located near the Square of the Virgin of the Kings. Coming from the modern western world, the older styles and colors of many buildings easily caught my eye. 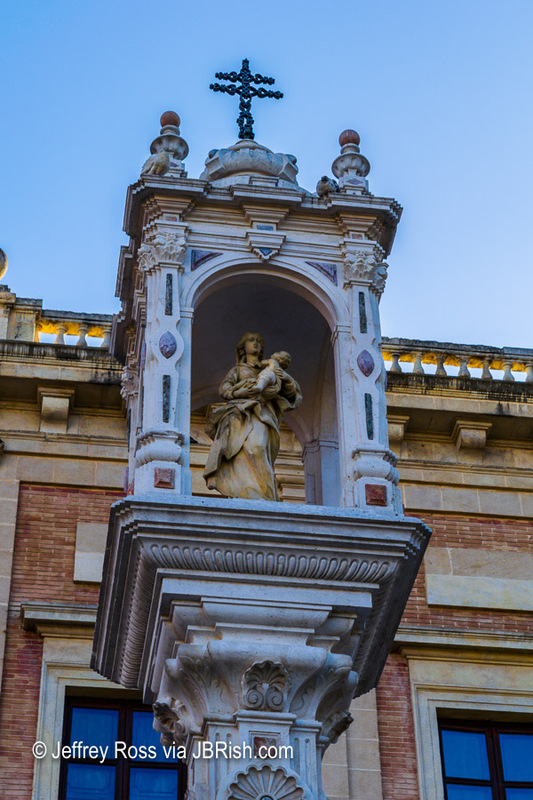 The Seville Town Hall is situated around the Plaza del Triunfo which hosted a statue commemorating the confirmation that Mary was born “free of original sin” and serves as a centerpiece for a local celebratory feast. It is sometimes mistakenly called the Monument of the Immaculate Conception. 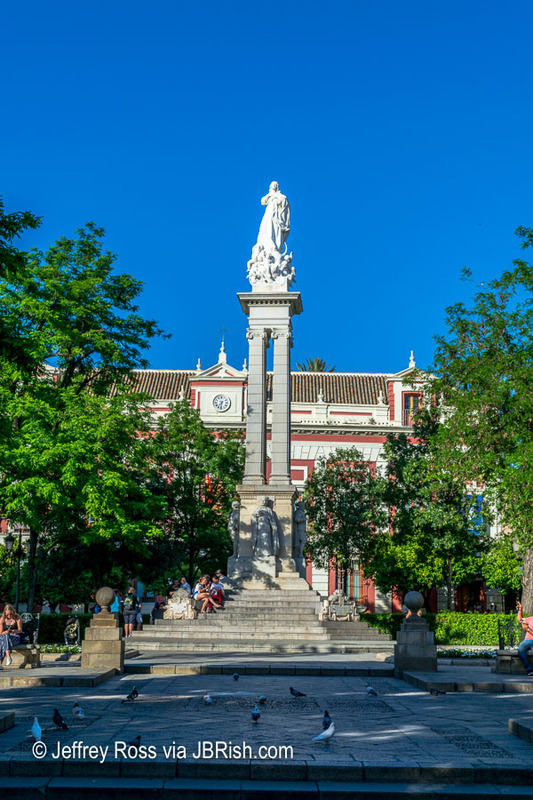 As we walked around the vicinity of Alfonso XIII hotel, we took some sneak peaks at places we were scheduled to visit on other days. This was our fist view of the entrance to the Alcazar. 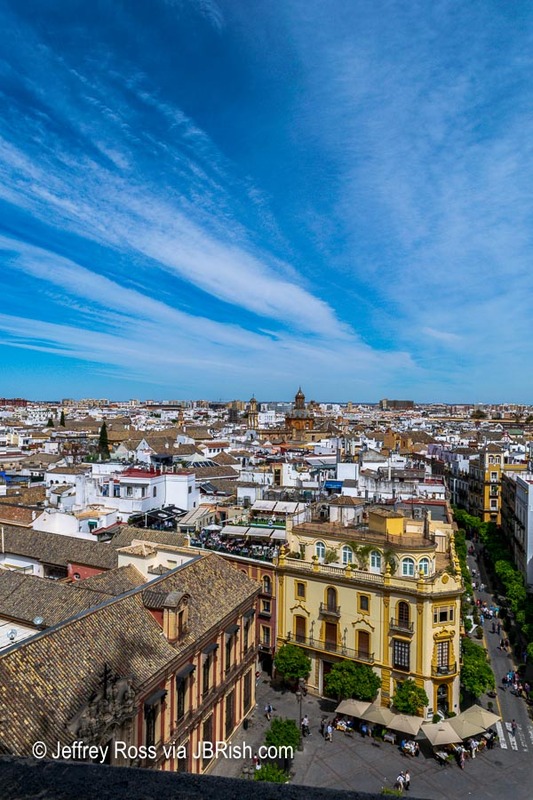 Christopher Columbus (Christobel Colon) has a strong connection to Seville which was the port from which he and his sailors set forth to the New World more than half a century ago. 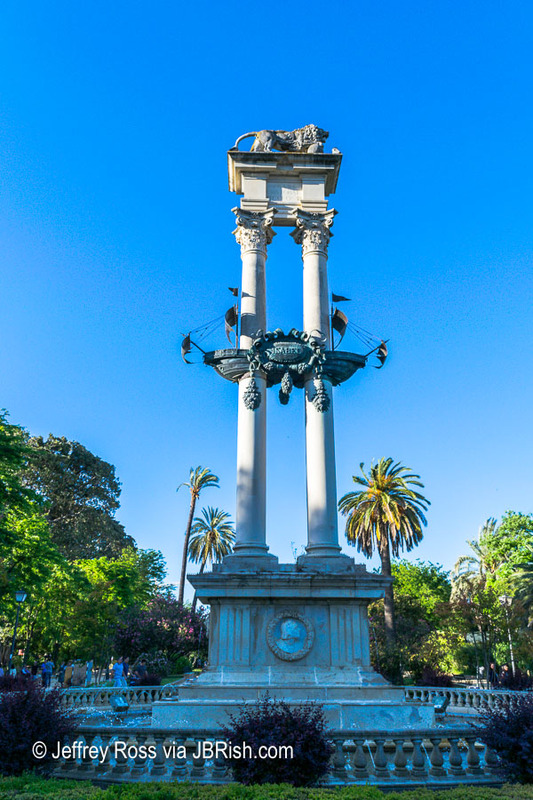 There are references to, and reminders of Columbus all around town such as the Columbus monument in the Murillo Gardens (below). It seems that I am getting a bit ahead of myself regarding Christobel Colon; more about him “later!” The gardens have beautiful wide paths and many plants, fountains, etc. to view during a leisurely stroll. 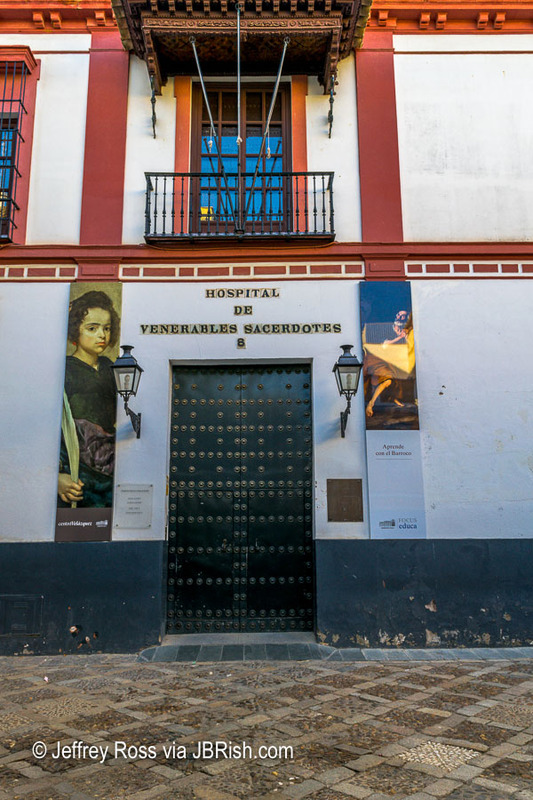 One of the items we noted on our list of things to visit was the Hospital de los Venerables. 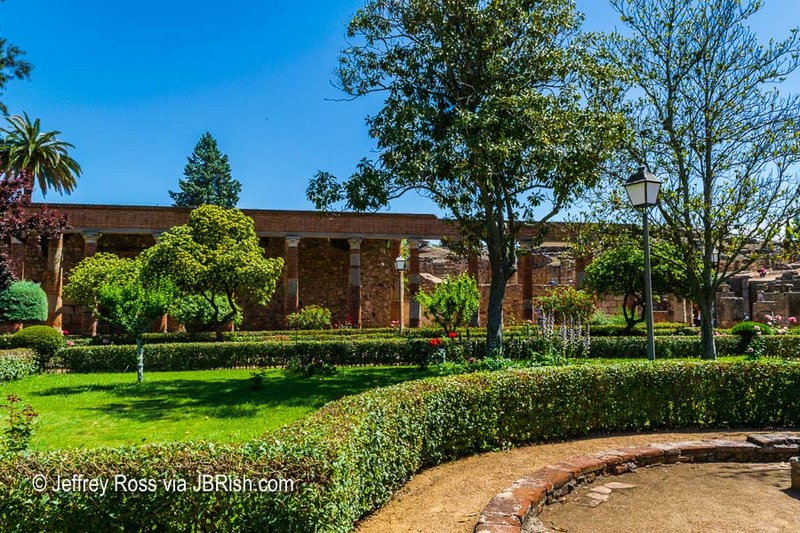 Once a hospice for priests, it now serves as a museum for a select group of paintings and other historic and artistic elements. 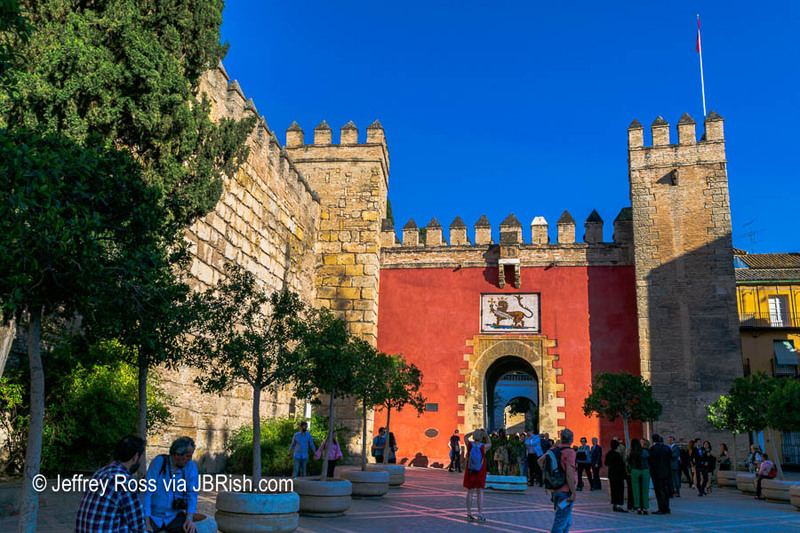 Time did not permit us to go inside, but many note that this is a “must see” if you visit Seville. 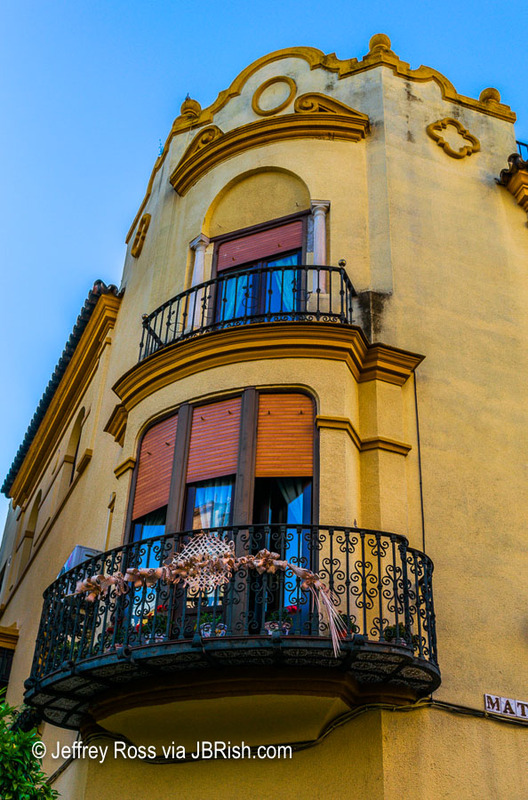 The beautiful buildings, many with ornate balconies, served as architectural exclamation points punctuating the surrounding avenues. 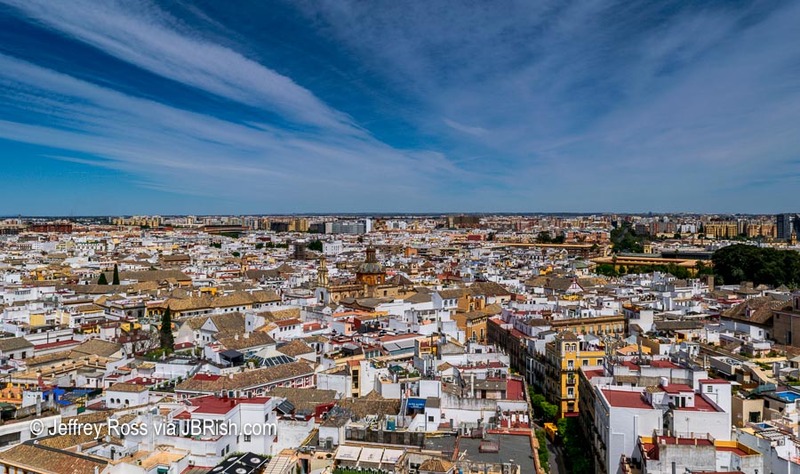 Towering above most of the streets around the center of town were aspects of the Seville Cathedral (Catedral de Sevilla). There is no wonder about this as it is the world’s largest Gothic Cathedral according to several sources. 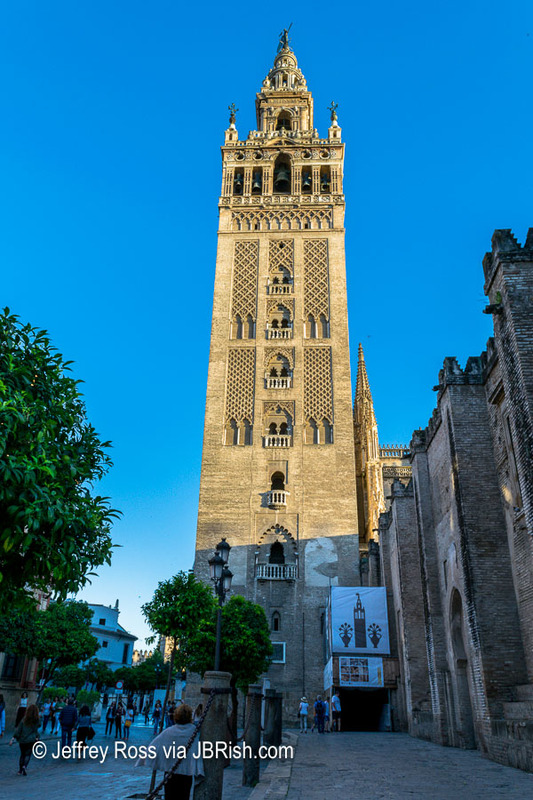 Below is a quick look at the Giralda or bell tower. We returned to the hotel to freshen up before heading out for a quick bite on our own. While walking along some of the nearby side streets, we came across San Marco, a rather romantic Italian restaurant where we enjoyed a nice dinner and a toast to the town. 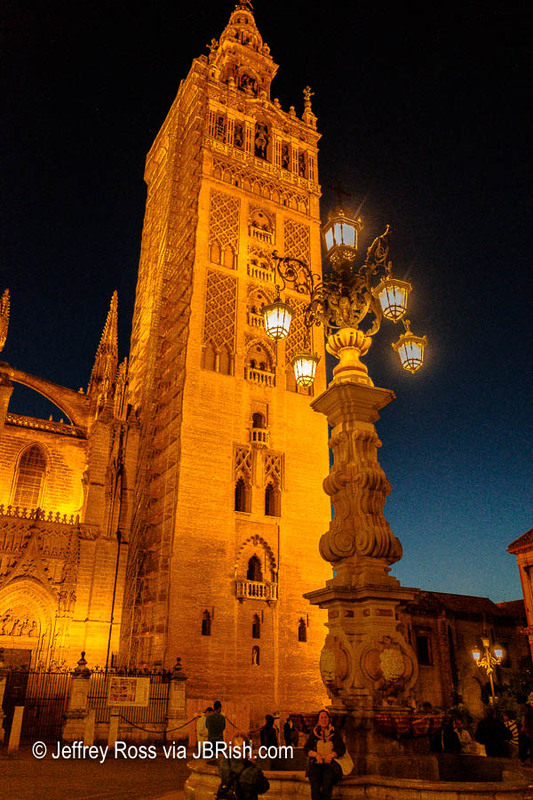 On the return to our accommodations, we enjoyed a night time view of the famed Giralda of the Catedral de Sevilla. After our busy initial day in Seville, we were eager to get some rest to be fresh for our next foray. 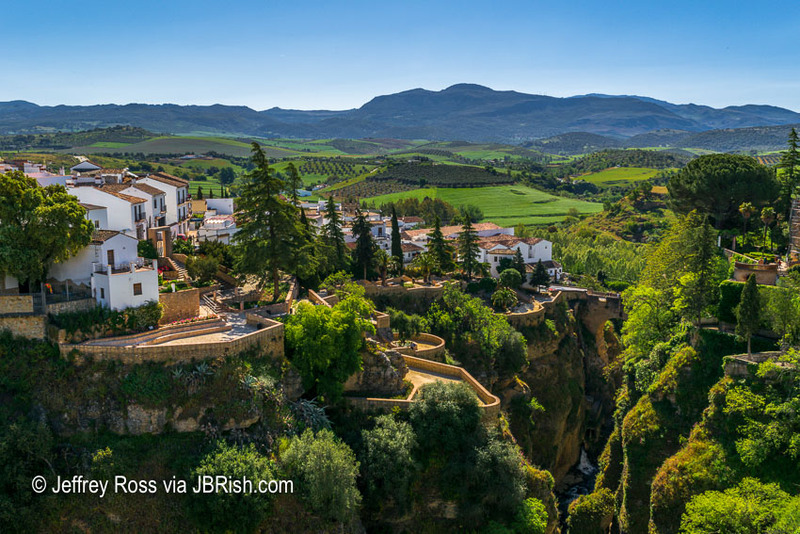 Merida, Spain is approximately two hundred miles southwest of Madrid and only a 3.5 hour ride from Lisbon. 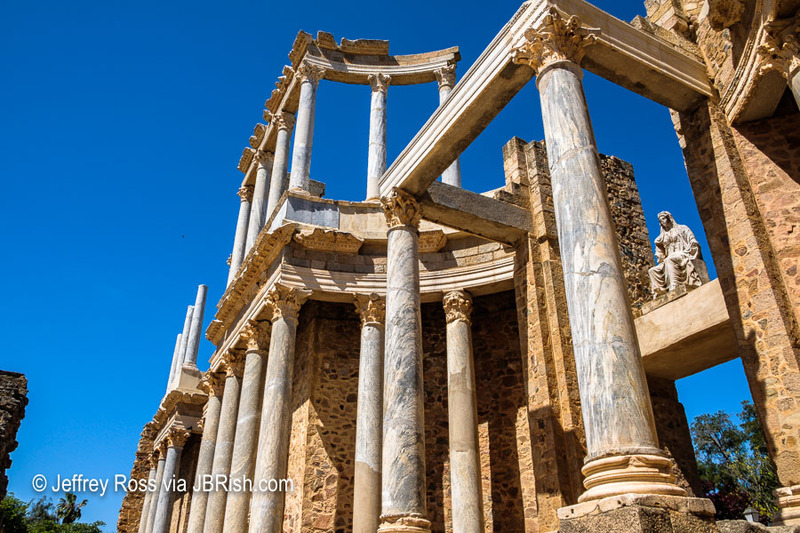 Tours of both Portugal and Spain often stop at this UNESCO World Heritage site to gaze upon the well-preserved ruins and monuments dating back to a time prior to the Christian era. 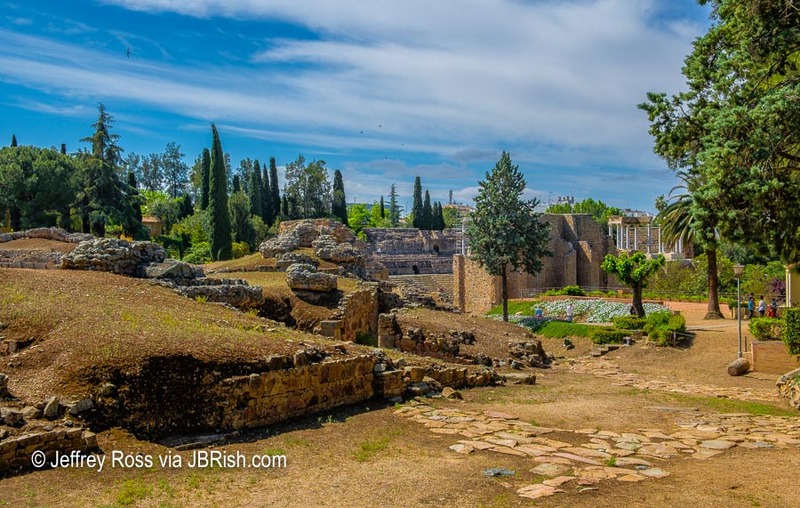 What makes Merida special among other cities on the Iberian peninsula is that it was one of the ancient Roman Empire’s most important cities and as such is home to numerous ruins. 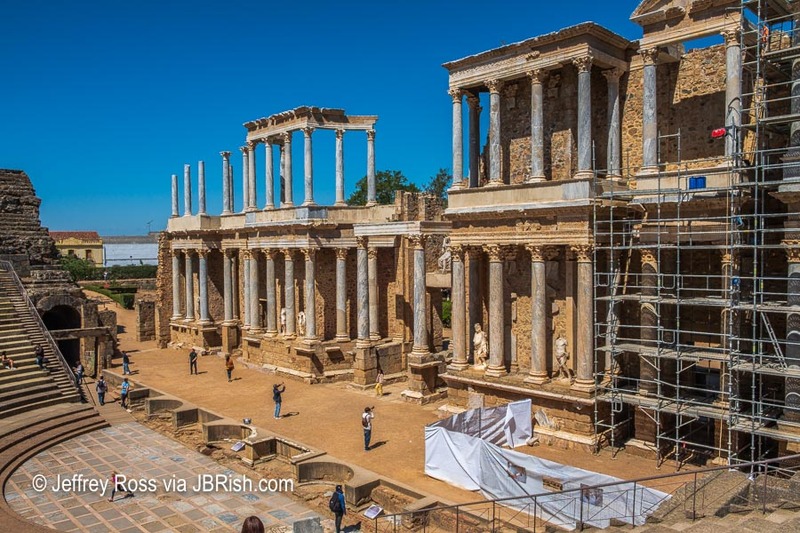 There are apparently more Roman monuments in Merida than any other Spanish municipality. 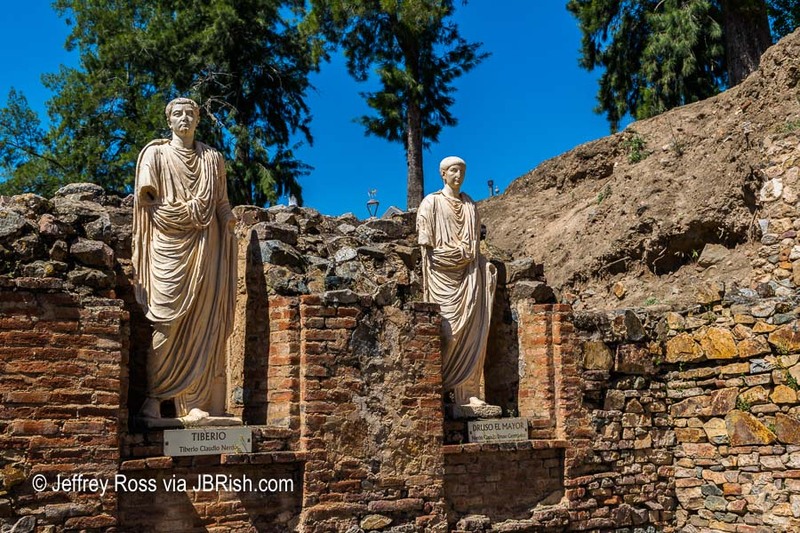 Just a short walk from the visitors center, the ruins become visible. 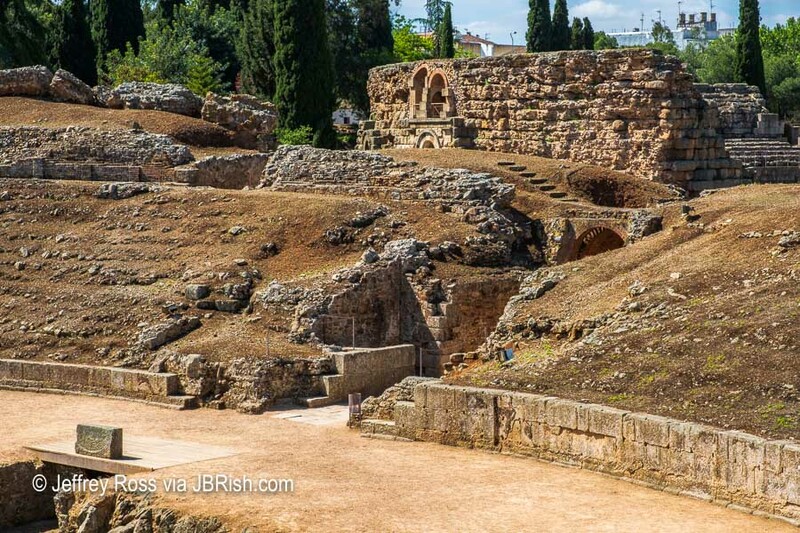 As we walked closer to the ancient structures, there were signs of the modern city which envelops this unique part of history (notice the rooftops and tower rising above the rim of the ancient walls in the background). On the way to a central area, our guide pointed to a series of horizontal rocks (below) strategically placed in the middle of the “road.” Notice that there are three large structures that elevate well-above the surface. These served the purpose of our modern day speed bumps. 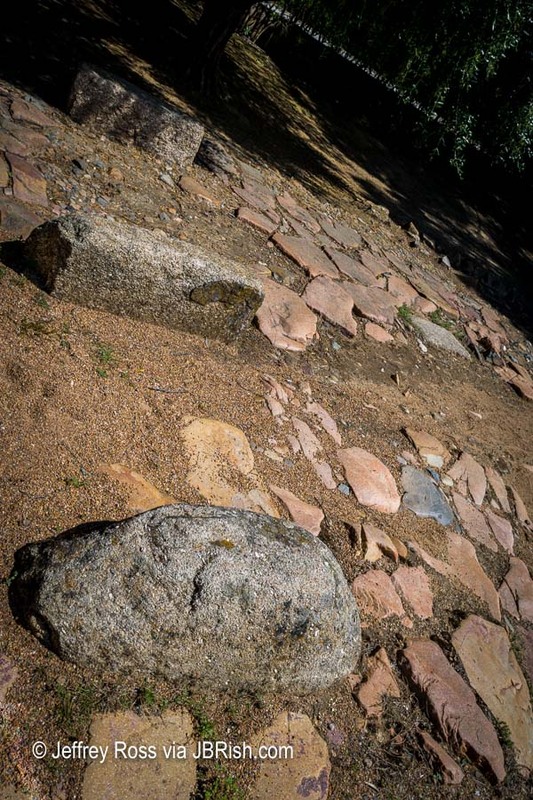 Ancient vehicles would have to navigate these hindrances by slowing down to keep the wheels on each side of the middle obstacle. 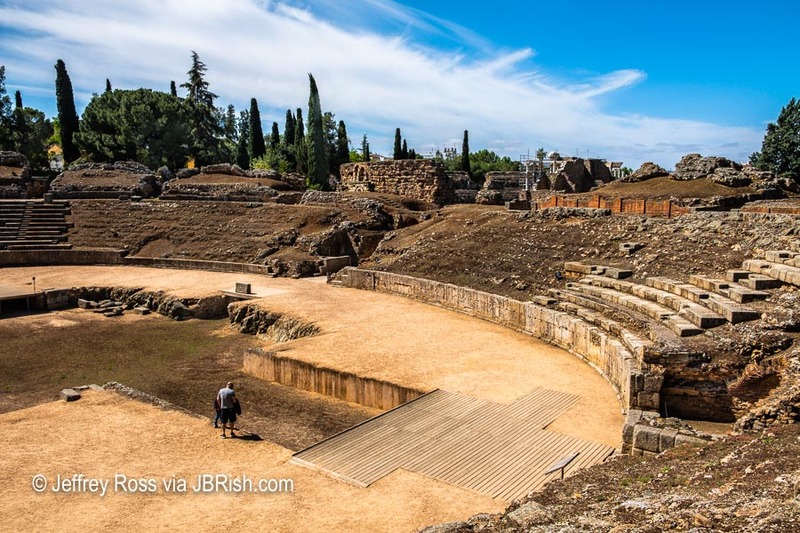 One of the two main attractions is the amphitheater. Visitor access is through the entry arch. 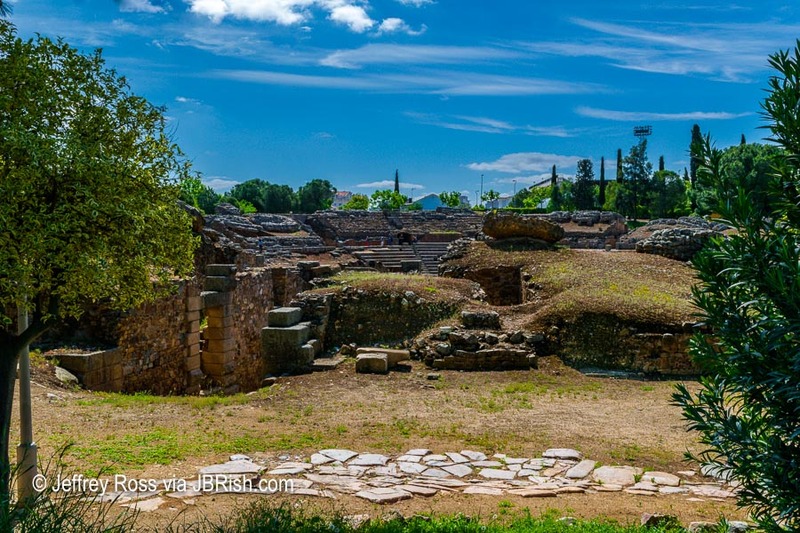 This is a view of one side of the circular area which is not fully restored. Perhaps this a better view from a bit farther away. 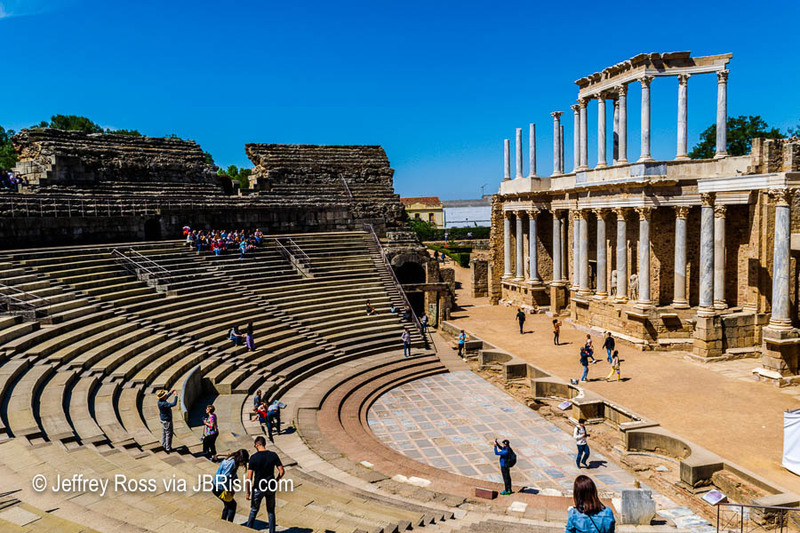 The partially restored amphitheater shows the contrast between how it probably looked during the Roman Empire and how it was discovered; a then and now comparison. 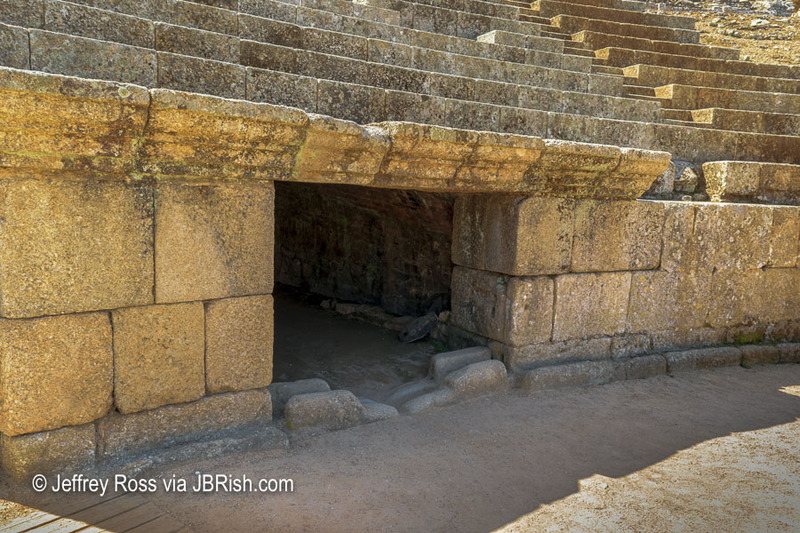 As depicted in many Hollywood films, this structure was used for gladiatorial combat. 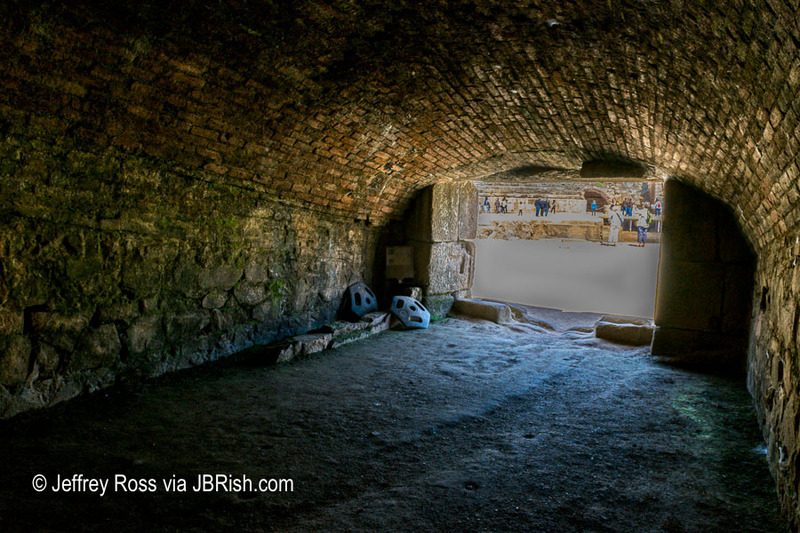 One can imagine the combatants walking through the entrance tunnels knowing what was facing them at the other end. With large crowds shouting for the victory of their favorite gladiator, the throngs needed a place to take care of their biological needs. 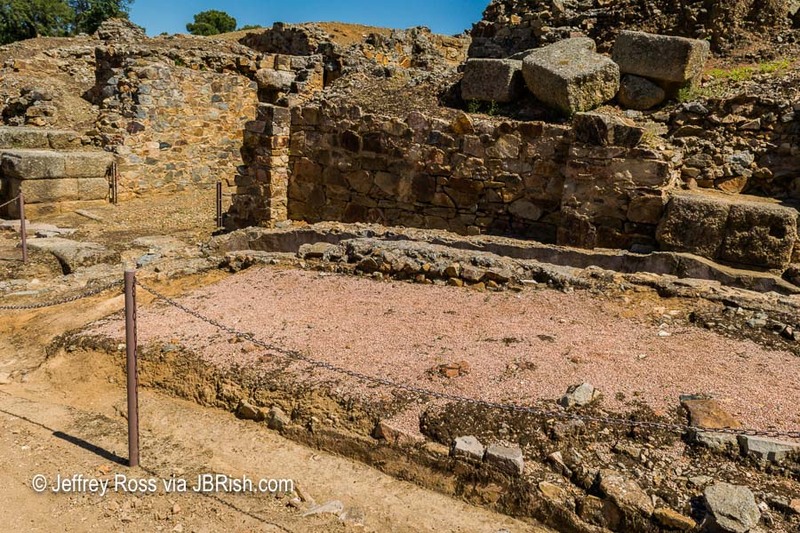 A latrine area is pictured below. 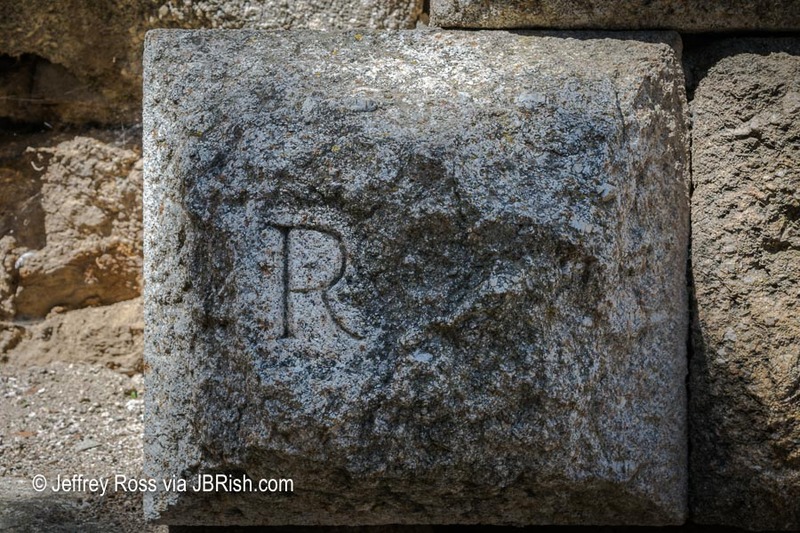 As we walked through the restoration project, we noted some stones had a large “R” chiseled onto their face. The guide explained that the “R” signified that this was not an original stone, but a reproduction. 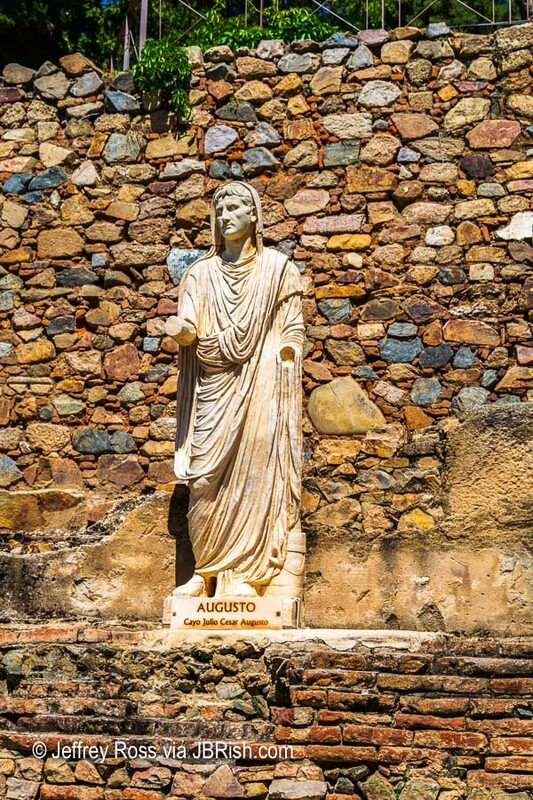 There were many original stones that have survived the centuries. 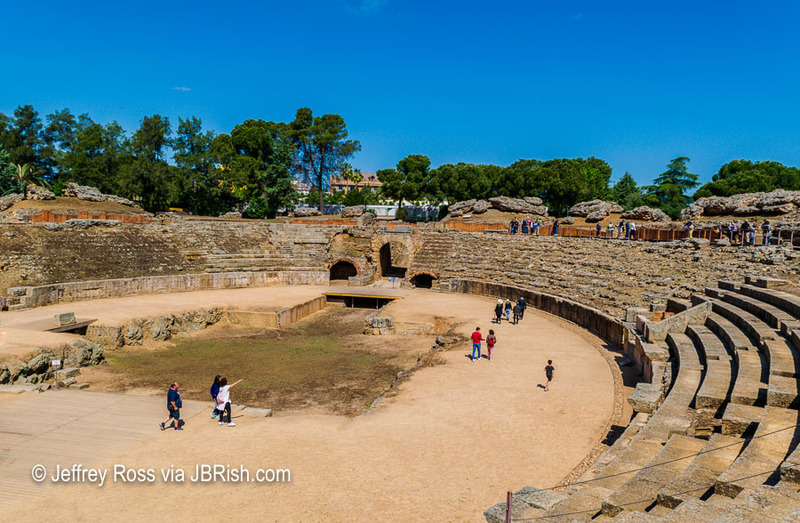 Leaving the gladiator ring, we headed to the theater which is still used for summer productions. Amid the scaffolding notice the statues between the columns. 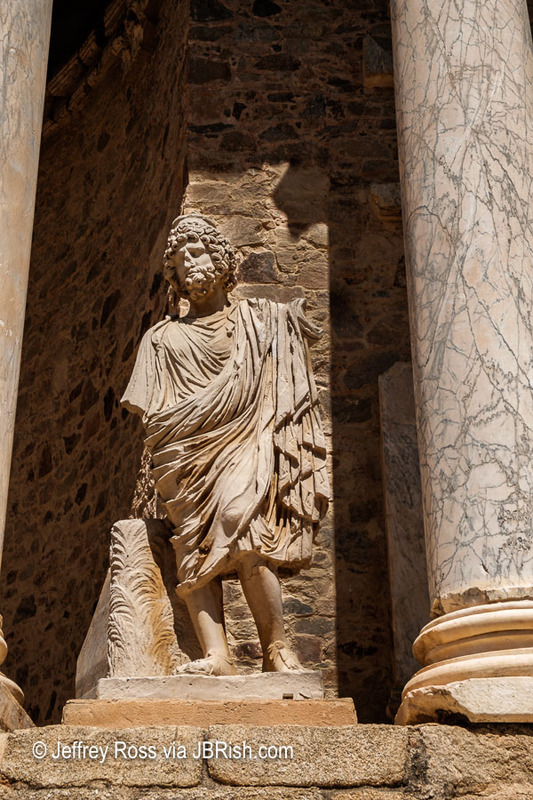 These are beautiful works of art representing this historic period. 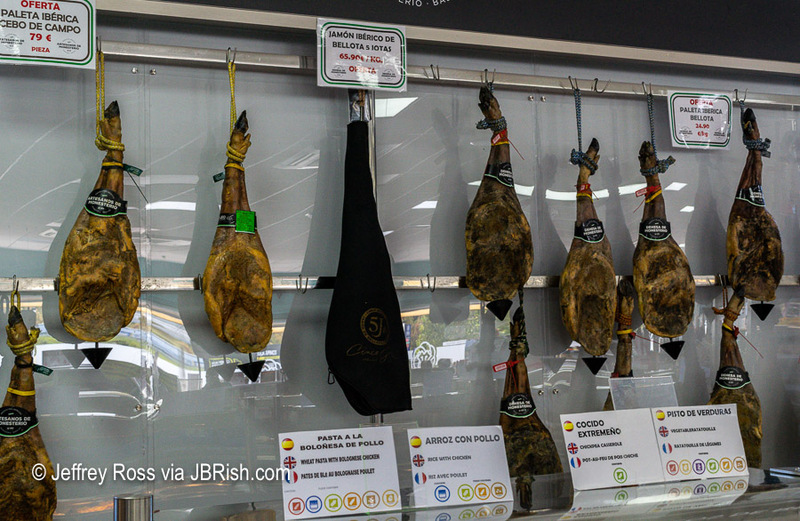 Some had names of their likeness (Tiberio Claudio Nero and Druso El Mayor)….. Walking through these old and almost unfathomable ruins, one cannot help being awestruck by the history and craftsmanship represented by these stone structures. See a brief video of the Theater. 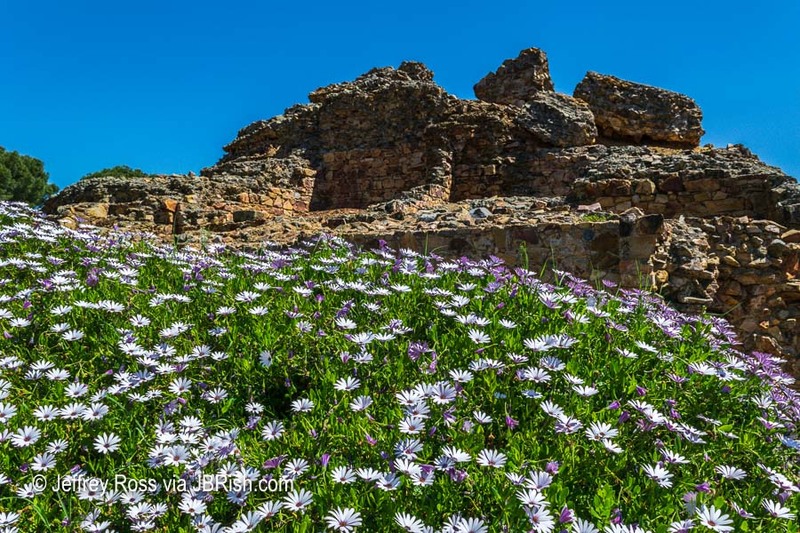 The areas immediately surrounding the ruins have been modernized with gardens, paths and water features. 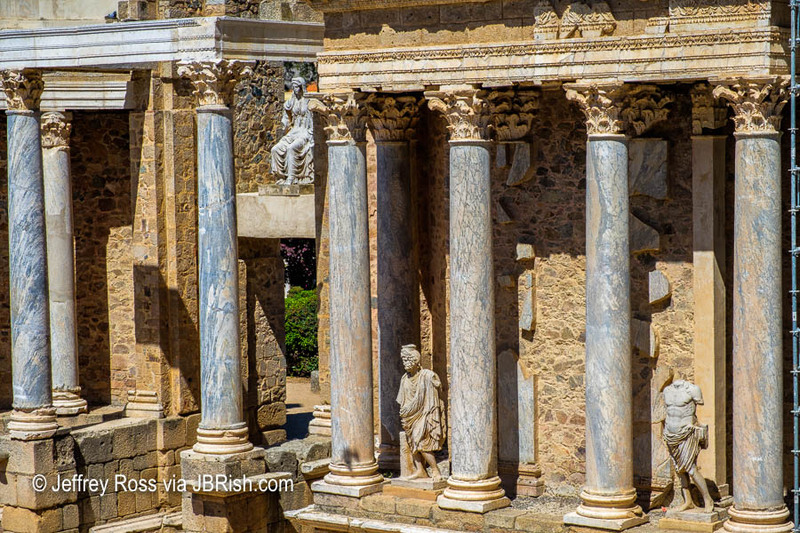 Rather than detract, they frame the Roman creations. The importance of the UNESCO World Heritage site does note escape visitors as there are reminders throughout the town. 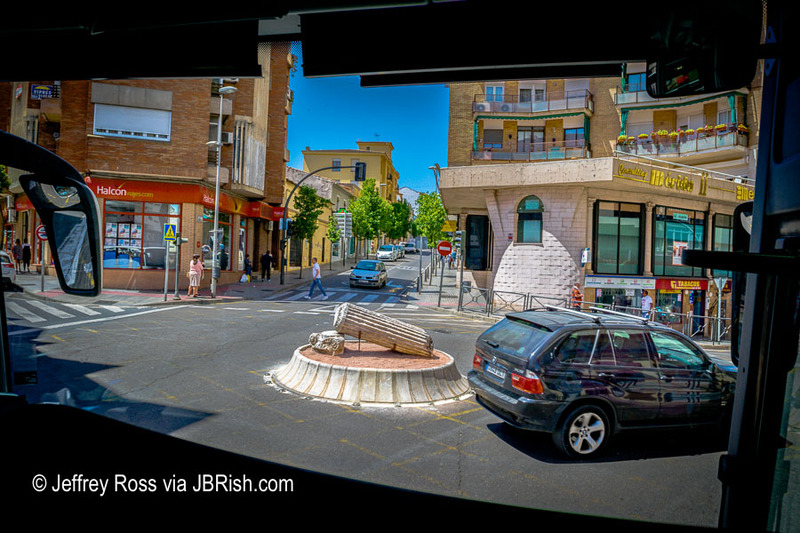 This was a view from the front window of our bus. 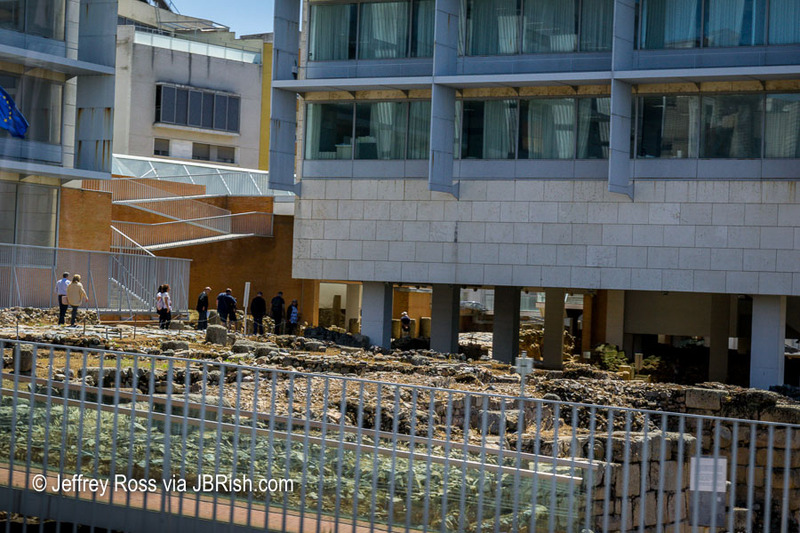 Notice the replica of a Roman column ruin at the center of the traffic circle. As with many magnificent finds such as this, there is often a yin and a yang. As the town plans for modern buildings, additional ruins are often uncovered. In many instances, construction must then stop and assessments made. This often delays, or in the worst case, cancels any renovations or building. 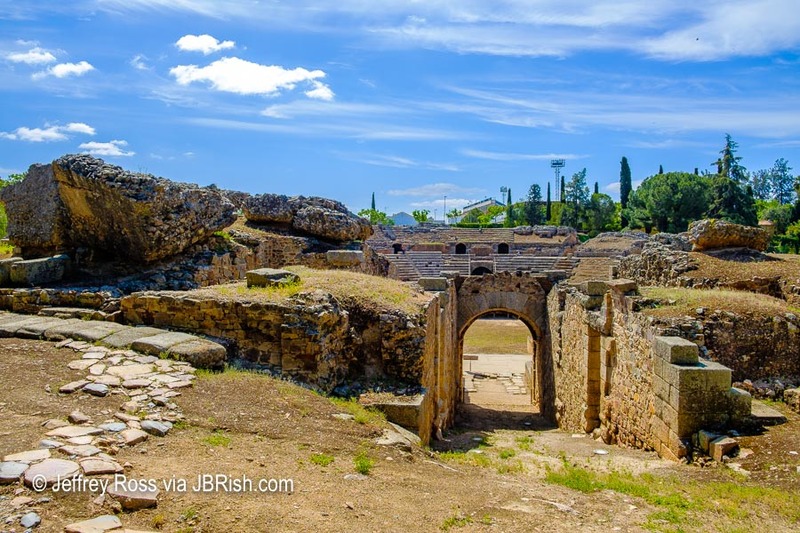 As we can imagine, this must be very frustrating to current residents of Merida wanting to upgrade their properties. 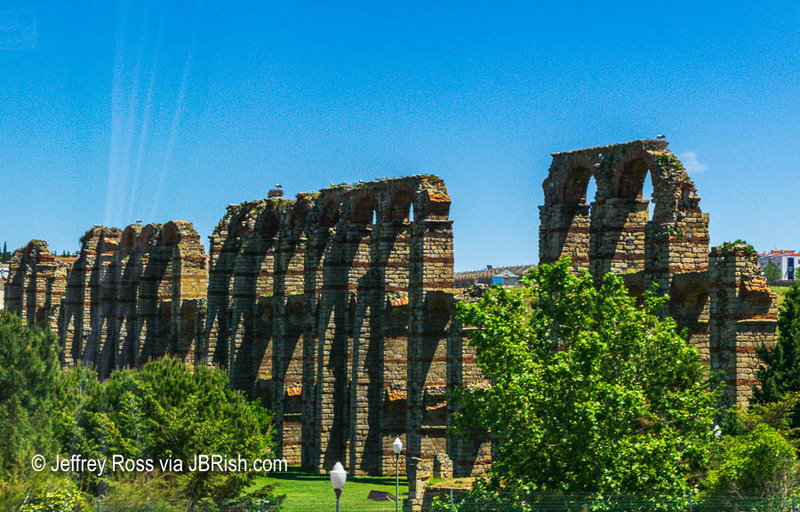 On the way out of town, we passed another impressive sight, a portion of the Acueducto de los Milagros (Miraculous Aqueduct). Only a small portion of the aqueduct bridge stands today. 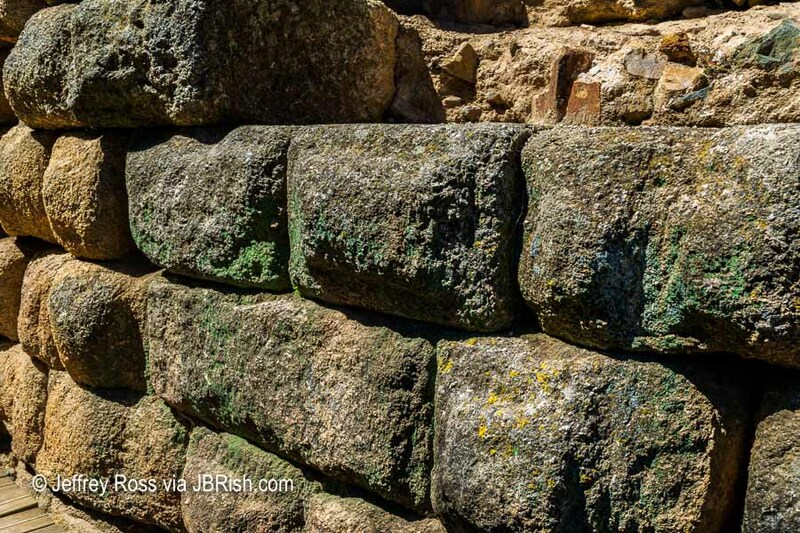 Many of the granite blocks were taken to be used on other structures before the aqueduct was a protected legacy. 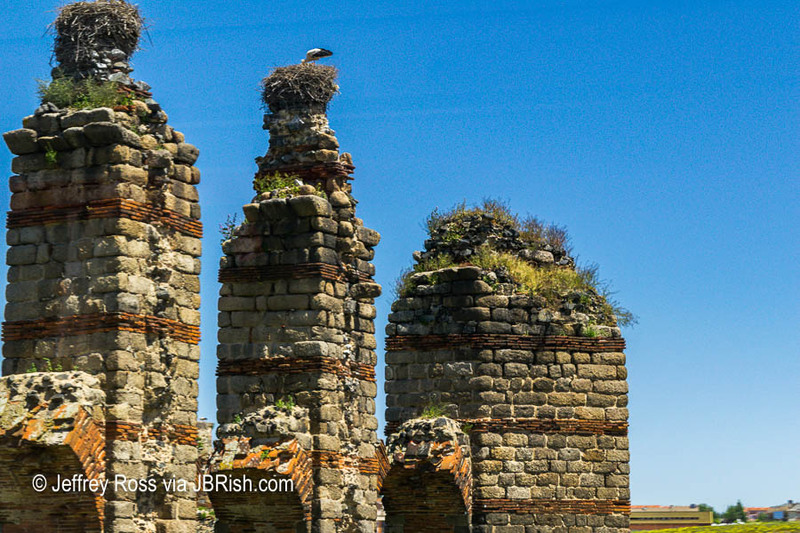 Storks are fond of nesting atop tall structures and being an ancient, historical piece of history does not concern them. The White Stork is given protected status in Spain and many towns make sure they are cared for because they are of interest to tourists. Of course after such an excursion, we needed to stop for lunch. 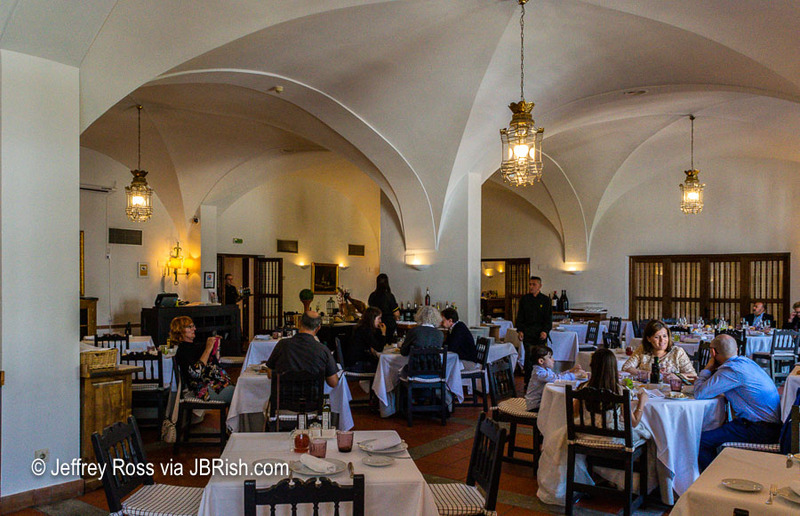 This is the Parador de Merida. 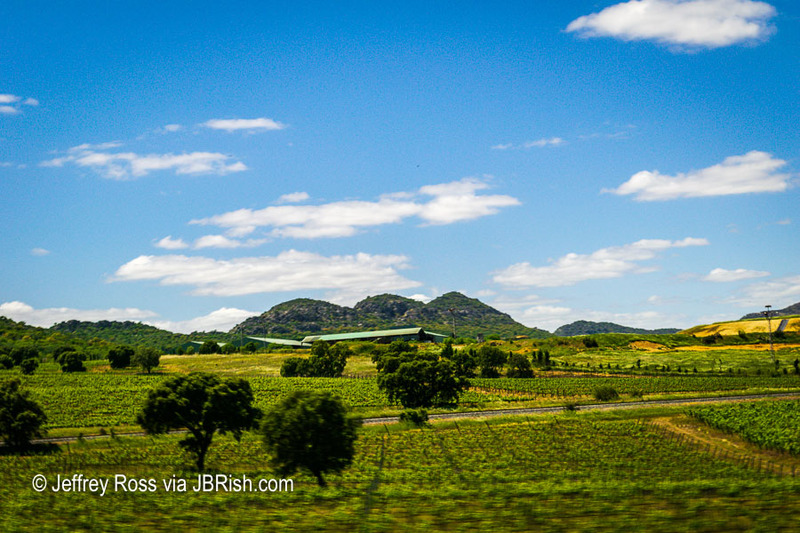 The ride through the countryside to our next stop, Seville, was charming and picturesque. My adventure with the Fuji X T-2 started almost a year ago. I use the word adventure deliberately because that has been my experience. I have read two books about how to set up and use the X T-2, but like much technology, all the books in the world often cannot prevent the unpredictable from happening. What I am about to explain is not technically the fault of the camera and I have to admit that all errors of the sort I am about to explain are clearly on the shoulders of the user; ME. I am merely writing this article so that perhaps others can avoid the frustration and/or disappointment that such occurrences can cause. 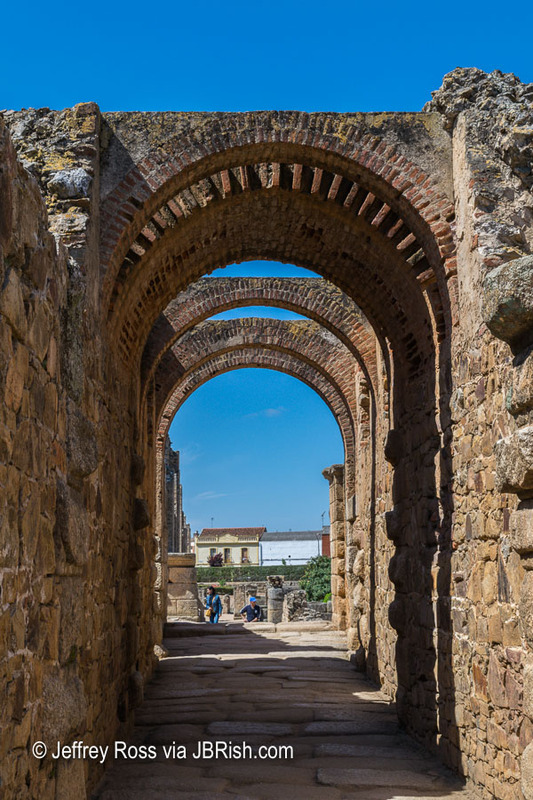 I recently returned from a trip to Portugal and Spain and of course I could not wait to download my photos to my computer once I got home. Imagine my surprise when all the JPEGs I shot with the X T-2 had a strong magenta cast to them. I was amazed since I had just used the camera prior to the trip without any problems. I couldn’t figure out what went wrong. I don’t do much international travel. Usually I am headed for landscapes in and around national parks or similar venues in the United States. When I do that, I often take a computer with me and each evening I download and review the files to double check that all is working as anticipated. I can then see if there is dirt on the lens or sensors and whether the settings are basically correct. Since I would be with a group on this trip and I was concerned about securing a computer when it was not with me and traveling light, I decided to leave the computer at home. There was another aspect that should have been a clue to me, but I didn’t pay enough attention to it. I was “lulled” into a sense of security. Let me explain: When looking through the viewfinder (EVF), there was a color cast to the live view image. I ignored it under the assumption that I had inadvertently adjusted the live view setting and that the pictures would not be affected. In the X T-2 references, I read about adjusting the EVF Color so I thought (my bad again!) that I had adjusted the EVF color inadvertently. This was a clue that I should have investigated further. What “lulled” me into this mindset was the knowledge that the white balance was set to AUTO so how bad could it be? When I would quickly look at the LCD, it wasn’t that obvious to me that there was a color shift. So imagine my surprise or disbelief when I arrived home and downloaded the pictures and saw that every JPEG had this rather overwhelming magenta color. I was truly puzzled. Trying to correct the JPEGs in Lightroom was very difficult, but what saved me in this instance was shooting RAW plus JPEG. The RAW files, although the finder images showed the same cast, were rendered perfectly once developed in LR. I tried searching on the Internet and through two books and the owner’s manual to see what the problem might have been. I was like a sailor lost at sea. I really didn’t know what I didn’t know. Thank goodness Fuji has an excellent support team. I called them and within five minutes I had the answer to my problem and learned how to avoid it in the future. APPARENTLY one of my settings was accidentally changed so that the white balance, although set to AUTO, was manually altered to change the hue of the light when a photo was captured. Like much advanced technology, the X T-2 provides a multitude of choices and with choices comes the possibility of more user errors or “accidental” system changes. The right selector button (see arrow above) surrounding the rear menu botton is set to change white balance hue by default. 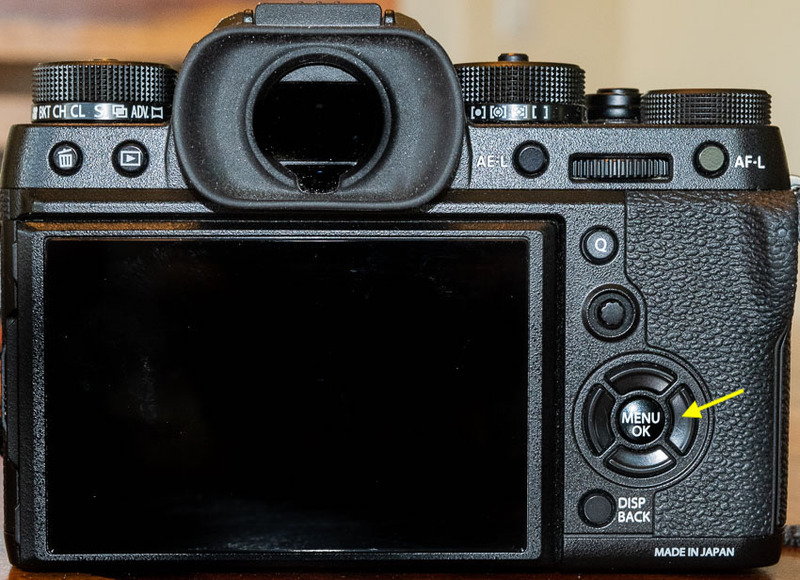 There is no lock on this button so when removing the camera from the camera bag, pressing that function button launches an option to change the white balance default color. If not noticed the user can be into the indavertent change for two or three unintended presses before taking the next shot. If it happens when the camera is being placed into the bag and being turned off, it may go unnoticed. 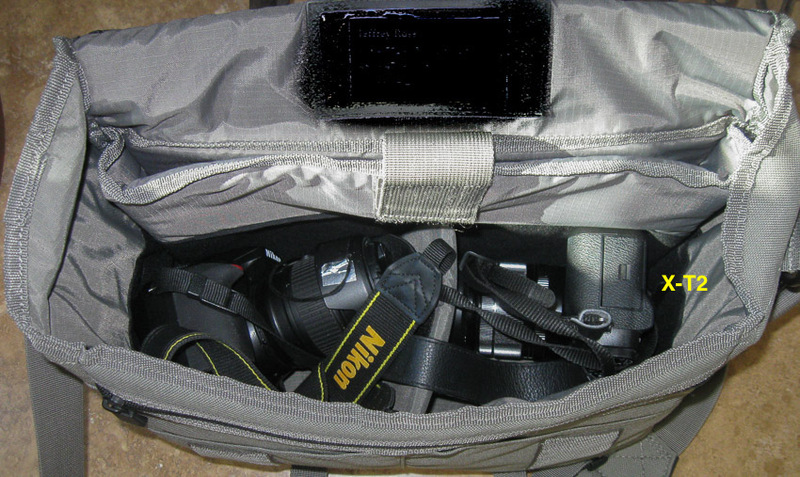 Here is my Tenba bag with my cameras in it. A closer look shows the arrow pointing to the area of the X T-2 where the selector button in question would be directly on the top side (see arrow below). You can imagine how it was possible or perhaps probable that the selector button would be pressed when grabbing the camera to take it out of the bag for shooting which I did several times a day. The technician at Fuji recommended that I change that partuclar function button to provide playback (a safe choice) which would remove that potential problem from my shooting workflow. Of course I also rebalanced the hue to the neutral position while I was making that change. This was my fault for not knowing what options these buttons controlled and what pressing them can do. You can bet that I will be checking them all before my next shoot! Would it be better perhaps for these buttons to be undefined by default and allow the users to program them as they see fit once the camera arrives at their door? I was shooting RAW plus JPEG which saved the pictures for me this time. I lost the ability to rely on the JPEGs for color reference, etc., but that was only a small price to pay (IMO) compared to what could have been. Spent more time and care assessing the photos via the LCD to check for color balance, sharpness, etc. Understood the purpose of the function buttons before going out into the field. Interesting that I have been using it for several months and haven’t had this problem before. Checked both cards in playback mode from time-to-time before getting home just to check on things. Given more importance to taking my laptop with me. Perhaps this would have been the wiser thing, but I am still not certain about this one. 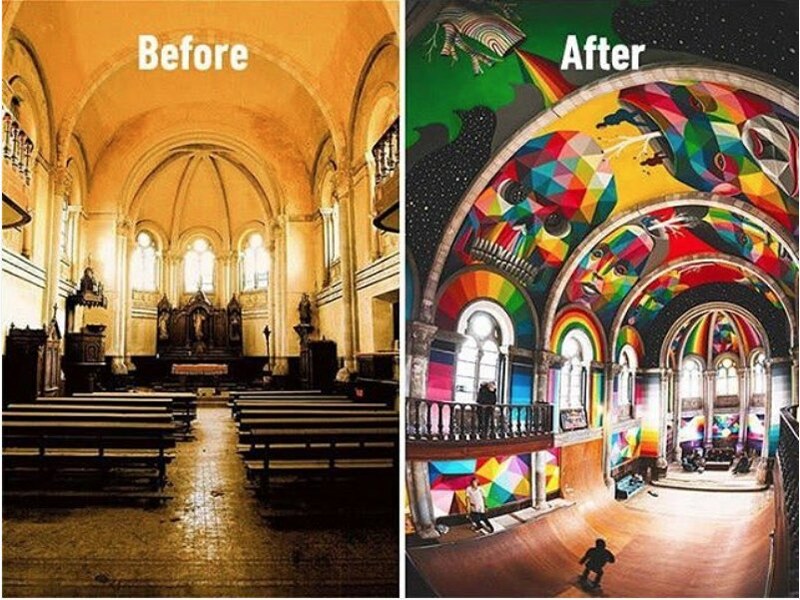 An abandoned church in Llanera, Spain has been turned into a skate park by a group known as La Iglesia Skate. It started small and picked up advocates along the way and has since been noticed globally. Padel is a relatively unknown sport and although I get many blank stares and “huhs?” when I mention pickleball, I find that less people know about padel which is popular in Spain and other countries around the globe. Watch the video below and decide if you would like to try it. See (below) how some of the best players in the world play the game. Notice how they can go outside the court and hit the ball back into the court to keep it in play!